It has been far too long since I’ve had a chance to sit down and blog! 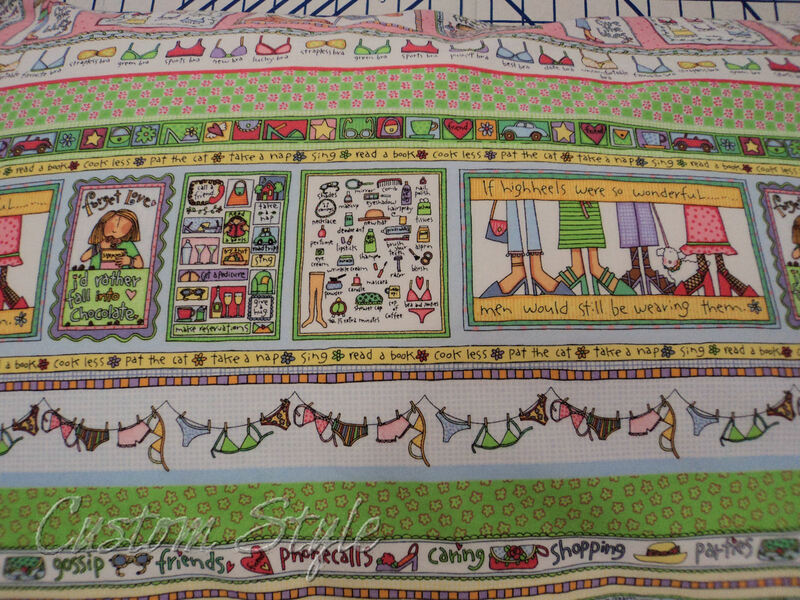 That doesn’t mean I haven’t been sewing – just more work sewing than fun sewing. If you follow me on Twitter or Instagram, you’ve seen little bits of what I’ve been up to since I tend to update daily. And you don’t need an account to view what I post there. I got about 90% finished with the reorg and then I started getting back-to-back jobs and the last 10% has been taking the longest to finish. But before I got work-busy, I did manage to build myself a new ironing table! Yes, table! No more wimpy ironing board for me! You might recall that I’ve been using the square end of my ironing board and ignoring the pointed end for years. I’ve always loved the large tables set up in costume shops where I’ve worked (there are usually multiple irons sharing one large surface). It was high time I had my own personal table at home! I’m not sure how long IKEA’s carried this, but I just noticed it recently. It was exactly the size/height I’ve been looking for to use as an ironing table base, and it is solid wood. Plus, it even had the bonus of drawers and shelves! The dimensions of the NORDEN sideboard are 47½” long x 16½” wide x 35⅜” tall. The height was perfect but the top surface was a little small. I needed something that wasn’t too big and would fit along the wall where I already had my ironing board without blocking the closet door. First, I constructed the sideboard table exactly as the IKEA comic book instructed because I had come up with my own simple plan to make the surface bigger without having to alter the original design. I wanted a surface area that was significantly larger than my ironing board, which measures 13½” wide x 53” long (to the narrow pointed end). I decided 60” long would be a decent size to fit my space while still being long enough to iron fabric yardage in one pass from selvage to selvage. 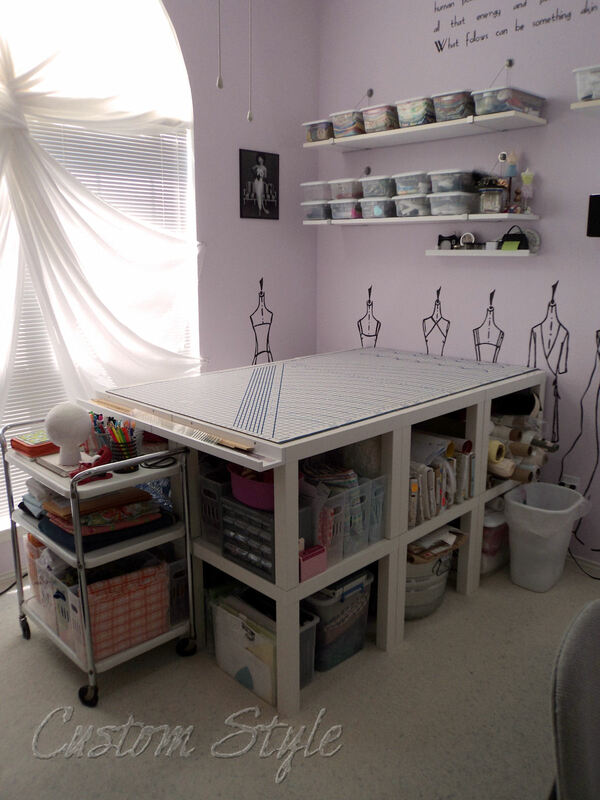 I also determined that 19” wide would not take up too much space in my room – I had to be careful not to make my sewing room feel crowded with the other furniture rearranging. 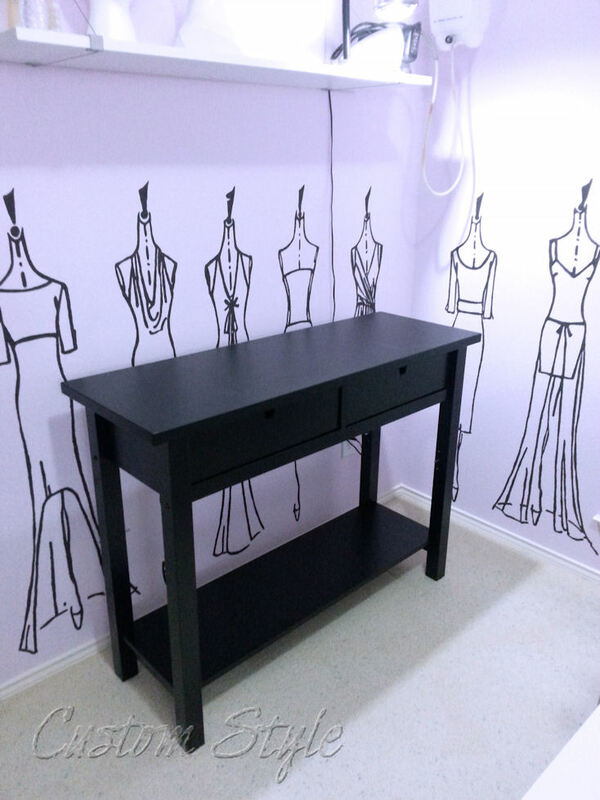 Norden sideboard assembled and placement determined in my sewing room. Plywood rectangle cut to finished size, two square dowels, and hardware. 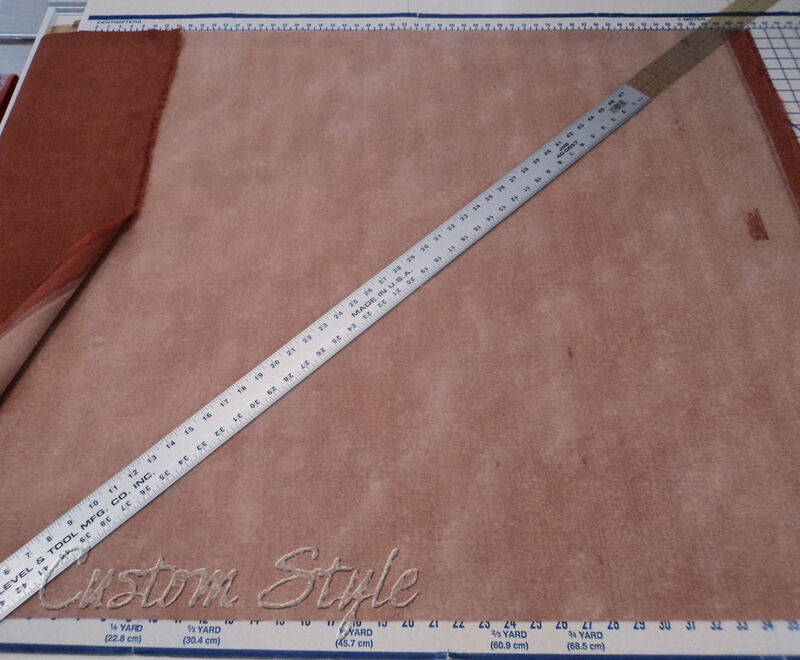 We cut each square dowel into 3 pieces measuring 3”, 14.5”, and 18.5”. The small 3” pieces were a good size to keep the dowels from blocking the drawers on the front of the sideboard. 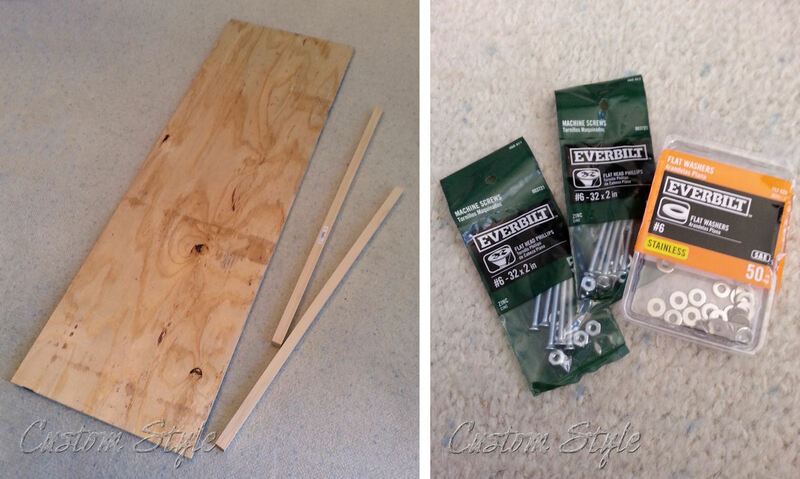 Exact size is not important as long as you are able to frame each corner of the existing tabletop with the dowels. We turned the IKEA unit upside down, placed it on the plywood top, and marked it so the base would be centered on the plywood lengthwise. (Note: make sure you remove the adjustable shelf before turning table upside down!) We offset the sideboard table a little closer to the front edge so that the dowel would be flush with the edge of the plywood (thus, prettier and easier to cover). Then we put some extra plywood scrap on the floor underneath everything. This was so we could drill all the way through the plywood top without worrying about drilling into the carpet beneath. A spare piece of ¾” plywood protected the carpet from the drill nicely. Starting with the two small front dowels, we butted them up to the edge of the sideboard and drilled one hole all the way through the dowel and the first layer of plywood that would be the new top. Then we unstacked everything and put bolts through from the top (the part that was facing the floor while drilling) and attached them with washers and nuts on the dowels on the bottom. After that, we did the same with one dowel on one side – drilling one hole on each end because this piece of dowel was longer. We continued drilling, unstacking, and attaching one dowel at a time so we could make sure everything fit perfectly and would be tight around the sideboard. Finally, we had the dowel frame all attached. It didn’t matter that the bolt heads weren’t perfectly flush with the top surface because I knew the padding I would be putting over everything would smooth any height difference out. 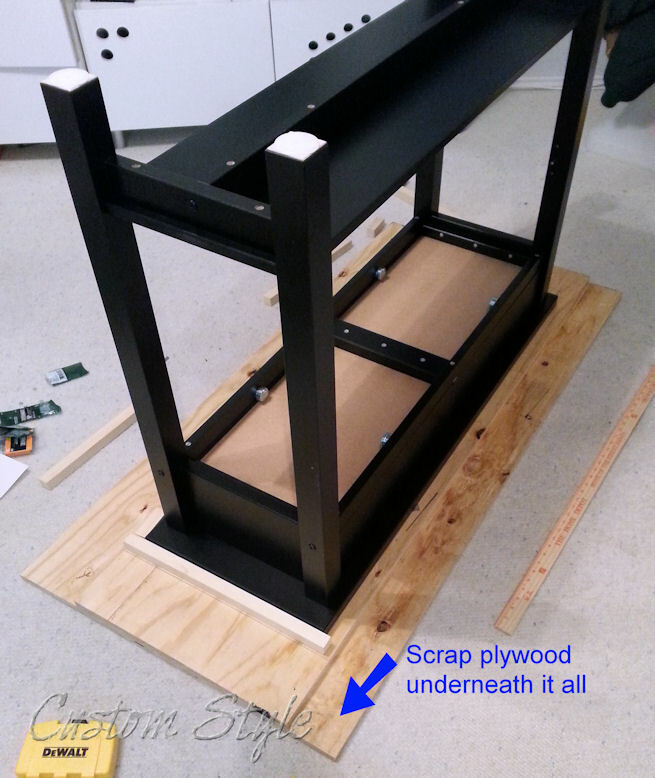 As long as the dowels were secure on the plywood, it was perfect. I initially had plans to secure the plywood top to the IKEA sideboard after covering it with appropriate ironing fabric, but it ended up fitting so snuggly we didn’t need to. For once, one of my crazy IKEA hacks actually turned out to be less complicated than originally planned! Win! My NORDEN has a bigger top! Here’s a size comparison of my new ironing table to my old ironing board. 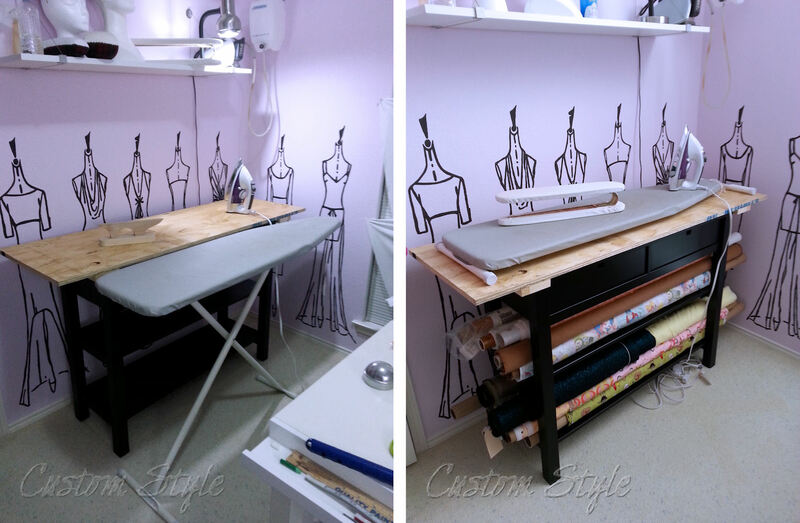 You may have noticed I was able to move my fabric tubes from under my cutting table to under my new ironing table. This was perfect because with my new furniture arrangement, the tubes were a little more in the way under the cutting table. Next came the hard part: waiting for specialty fabric to come in the mail so I could cover the plywood top. 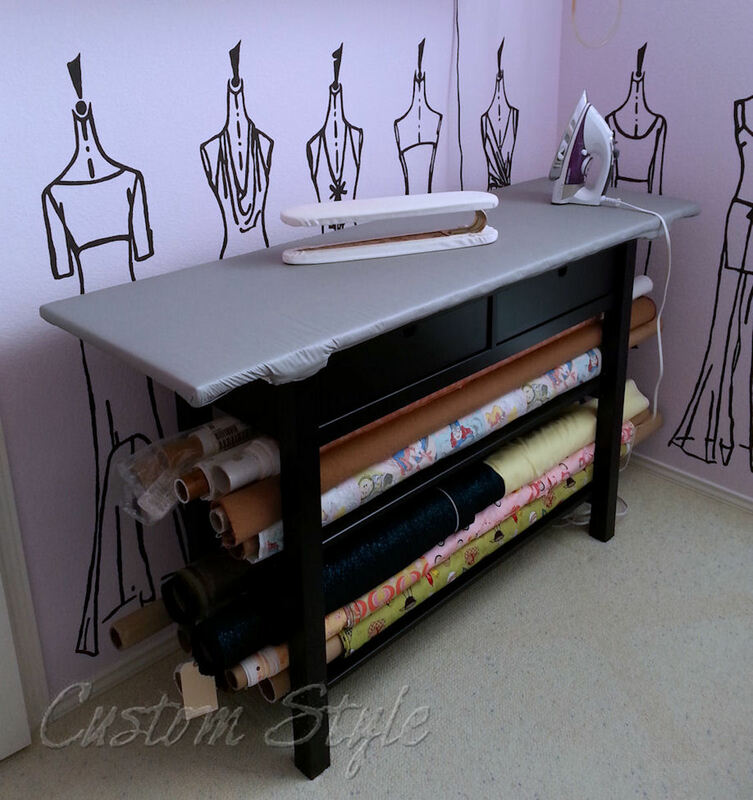 The best ironing tables in costume shops are covered in a drapery interlining fabric called English bump cloth. I read somewhere (apparently I failed to save the link) that it was first used as a curtain interlining for British royalty in order to better insulate palaces from the cold and damp. 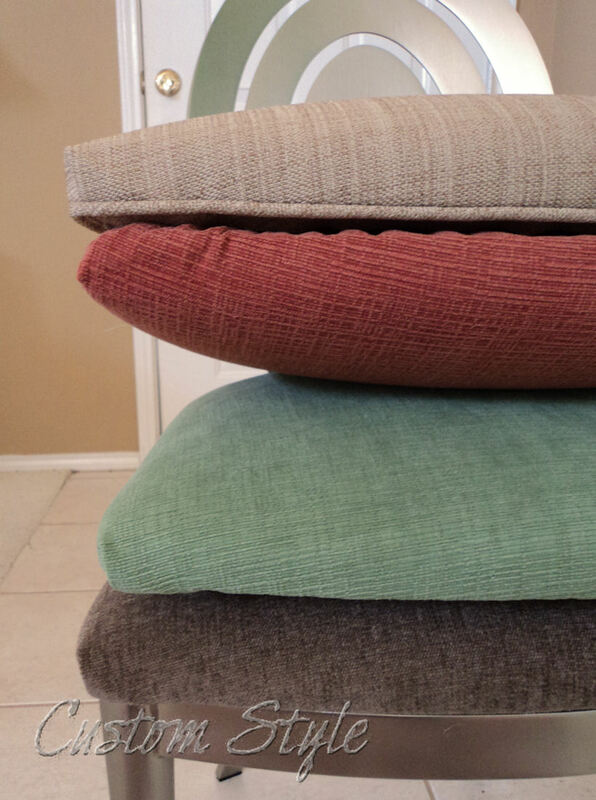 Bump cloth is a thick, somewhat flannel-like fabric that adds body and structure to fancy drapes. I found some at Fabric.com in my first search and placed an order. Even though the website said there was around 40 yards in stock at the time, I received an email a couple days later saying they were sold out. Grrr. (I have had such rotten luck with Fabric.com completely filling my last few orders!) If you feel like taking a chance with them, here’s the link for their Hanes Drapery Interlining Bump Cloth listed as item #UK-528. Once I learned I wouldn’t be receiving my first order of bump cloth, I started looking elsewhere. 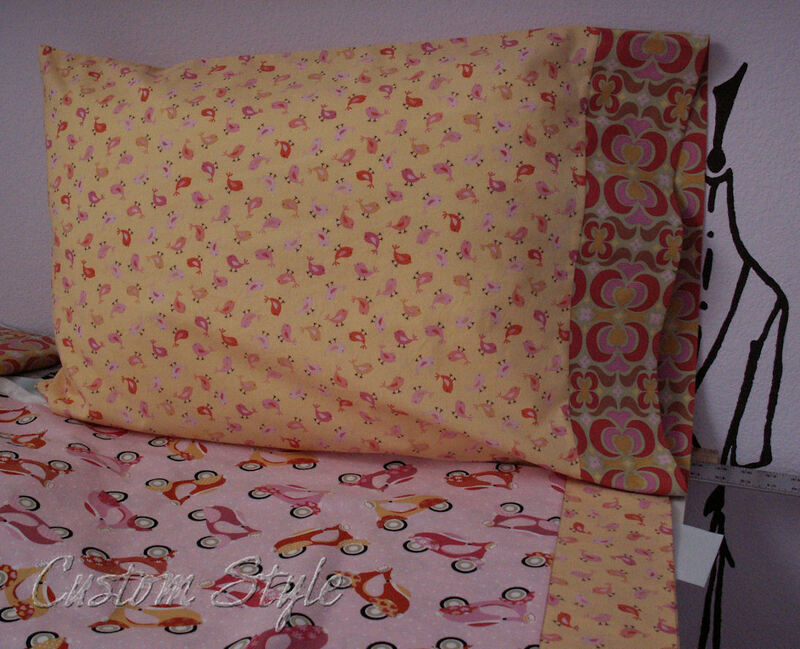 I eventually found some at BuyFabrics.com and it was less expensive than Fabric.com’s! I quickly ordered 2 yards (I was planning to use two layers to cover my plywood top) and they shipped within 24 hours! Here’s their link for English Classic Bump Natural Interlining. While I waited for my bump cloth, I went to my local JoAnn Fabrics and purchased 2 yards of aluminum coated ironing board fabric in their utility fabric section. (You can also buy it on their website.) I knew I wanted another silver ironing surface like I had on my ironing board before because it looks better for longer. 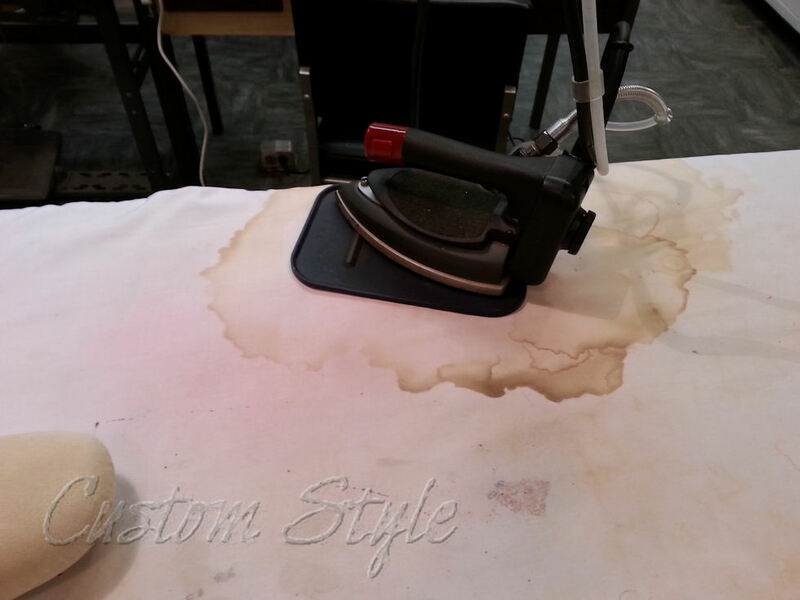 Most costume shops cover their ironing tables in muslin, but leakage from irons stains muslin. Ick! stained muslin on a costume shop ironing table. My silver cover never stained so visibly in all the years I had it despite an occasional iron pee. As of yesterday, Fabrique! (the little fabric store where I work part-time) also started carrying silver ironing board fabric! You can order it from the website as well. From what I can tell, this fabric might have a slightly heavier muslin backing for the aluminum than what JoAnn sells. Too bad I wasn’t able to buy it from work when I needed some! Finally, my bump cloth arrived and I could finish my ironing table! 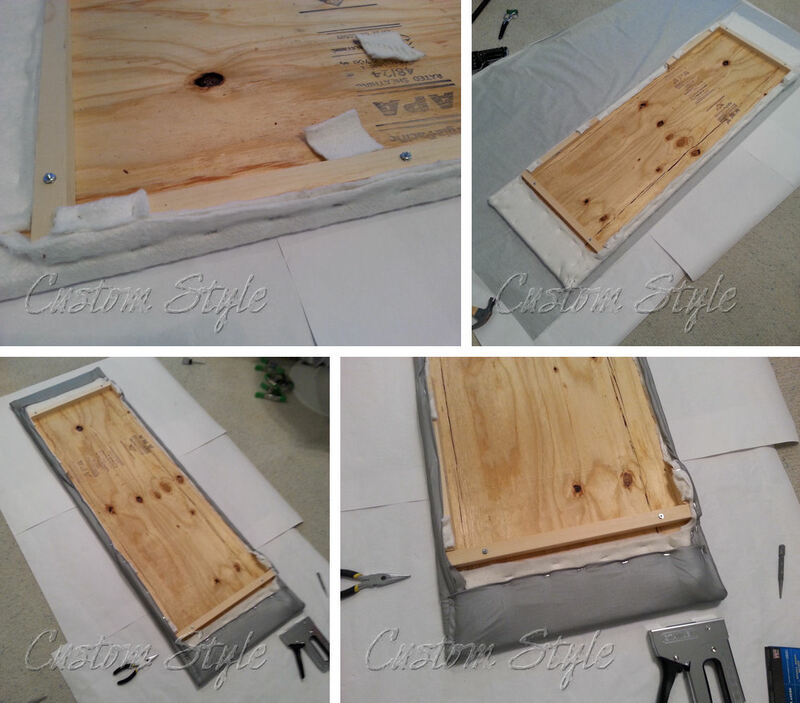 The following steps can be used to cover any wooden table surface to create an ironing table if you already have a piece of furniture and don’t want to buy a NORDEN sideboard. 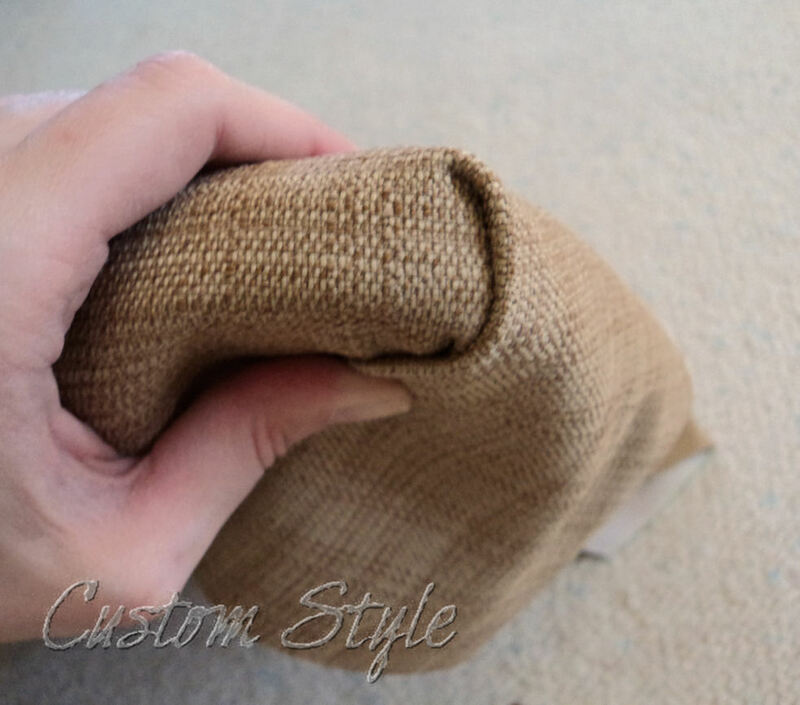 I cut two strips of bump cloth slightly wider and longer than the plywood top and laid them pebbled side down (slightly ribbed/striped side up) on a paper covered work space on the floor. Then I placed my plywood tabletop on top of the fabric. Then I folded and stapled both layers of the bump cloth (at the same time) to the plywood, starting with one long side and then attaching the opposite side to make sure it was tight. The handle end of a metal nail setter allowed me to hammer staples all the way down along the dowel edges. After securing the long sides, I neatly folded the corners and stapled the rest into place. I discovered, even after pulling the bump cloth tight, there was still too much slack when I rubbed the top surface. 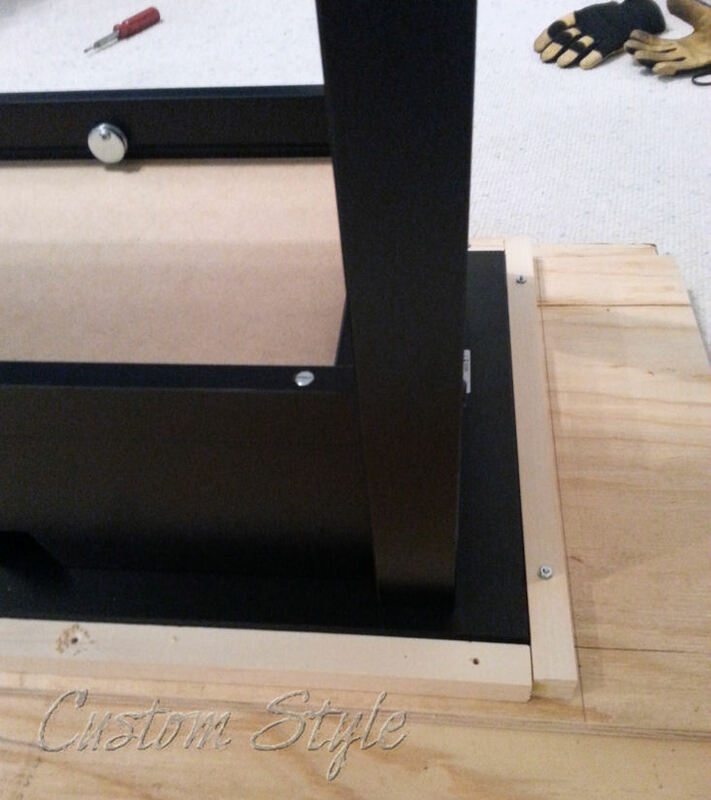 So I pushed the extra up toward the front of the tabletop while my husband held and spring clamped the excess in place. To correct the slack, I pushed the extra fabric to the front edge and stapled it down. Then I moved the extra fold of fabric to the underside. This ended up working well because there was no dowel across the front and the little ridge of extra fabric created a nice little lip to mask the front edge of the sideboard top. 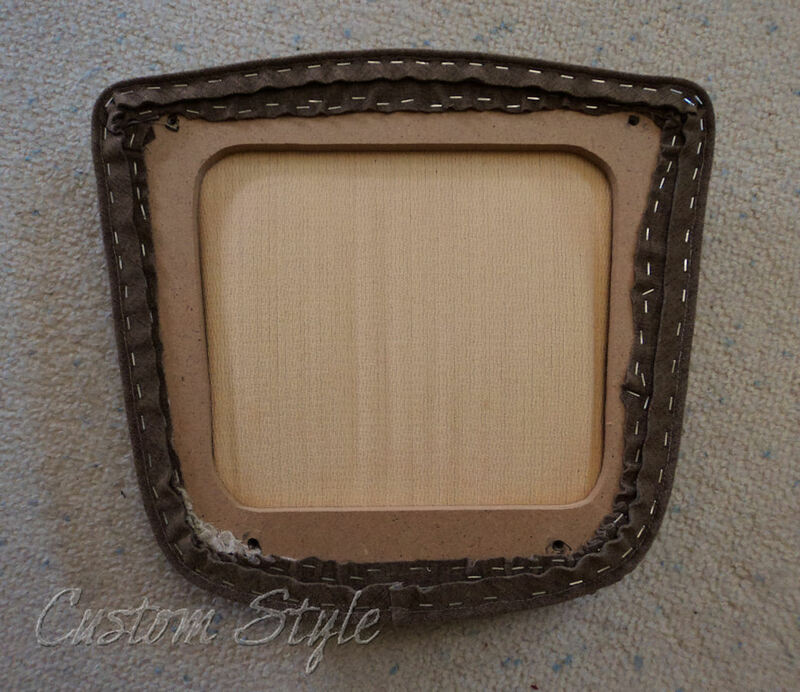 I used scraps of bump cloth to cover the nuts and screw ends so nothing could catch on them while I ironed later. Then I covered everything tightly with a layer of silver ironing board fabric stapled on through all the layers. I love my new ironing table! 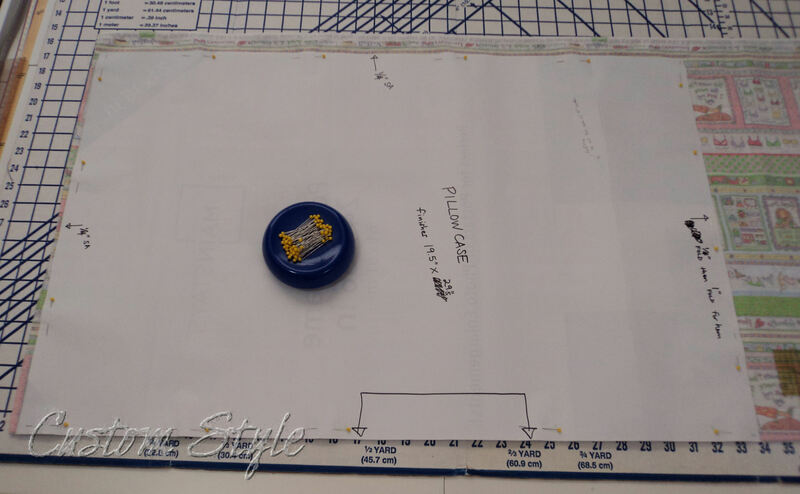 Bonus: I no longer need to iron yardage in steps before I roll it – I can roll as I iron! And all my ironing tools fit in one drawer while my press cloths & ironing products (aside from interfacing) all fit in the other drawer. I chose to hook my sleeve board over the right edge of the tabletop because I use it often and it makes the tool drawer a bit crowded. I don’t need to leave everything on the open shelf above where it gets dusty – now I only keep spray bottles and sizing etc. on the shelf above. Ironing and rolling fabric in one step! And everything fits in the drawers! I just need to clean up the used gravity-feed industrial iron I bought used years ago, and I’ll have totally finished my ironing upgrade! 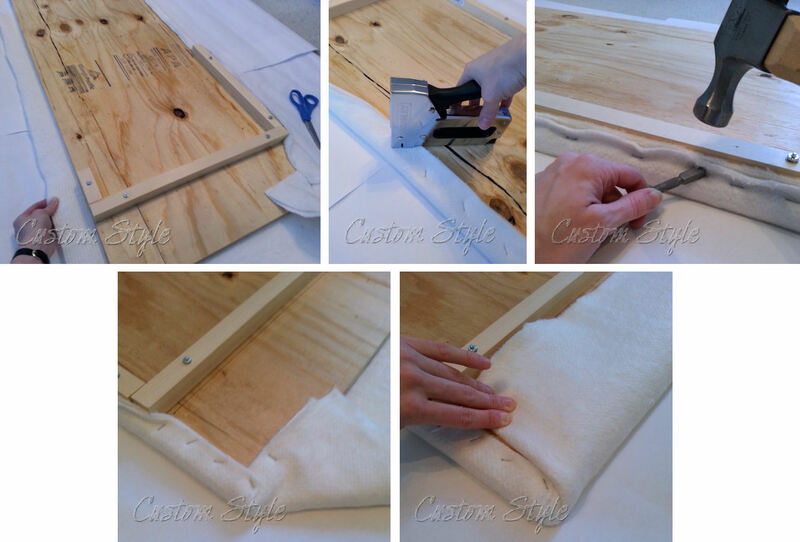 I hope you find the above tutorial helpful and are inspired to build your own ironing table! Send me a photo or link if you do – I’d love to see! Newly covered chairs around my aunt’s kitchen table. The foam of the seats was still in good condition (only the fabric covering it was wearing out) so luckily I didn’t have to rebuild anything. poking out of a few holes in the fabric. After removing the seats from the chair frames (they were attached with four screws on the bottom of each cushion), I inspected the original construction and reverse-engineered them. 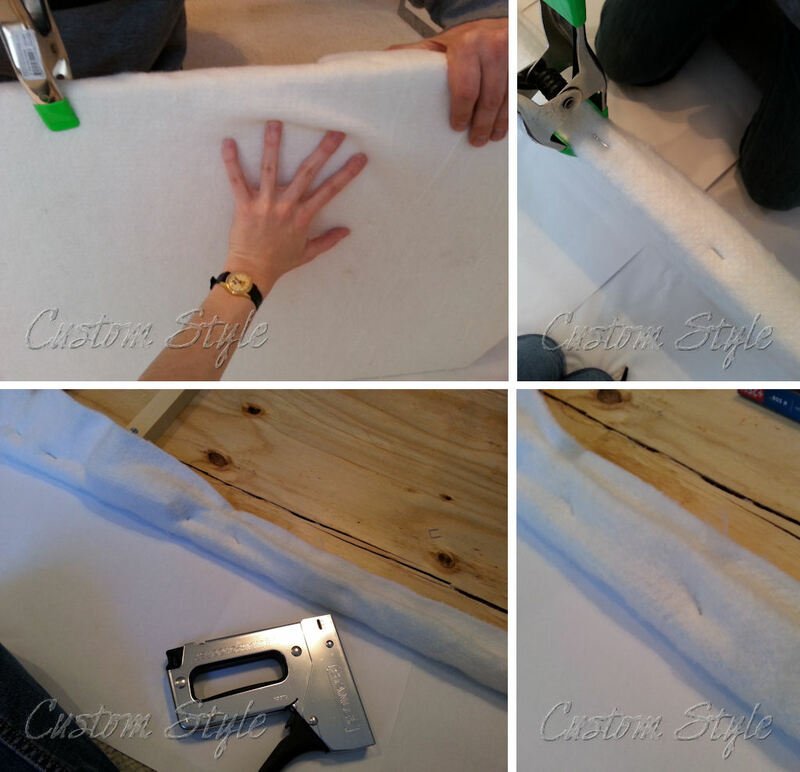 I was relieved to discover that the foam had been wrapped in fabric and the matching fabric piping had been stapled to the cushion base separately. This meant that I only needed to remove the existing backing & piping before recovering them and I wouldn’t have to sew the new piping to the new cover. 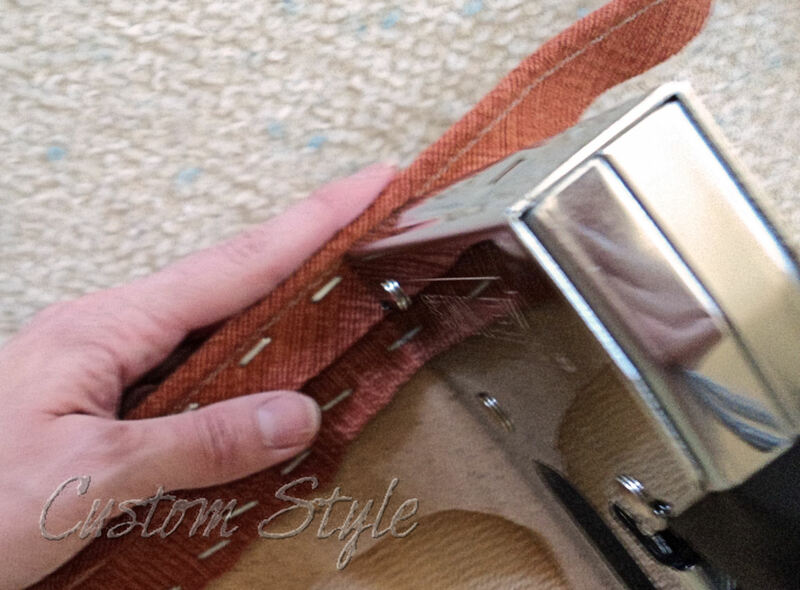 I removed the piping & the backing staples by forcing an awl between the piping and the cushion base to loosen the staples so that I could grab them with needle nose pliers. I removed quite a pile of staples and I was so glad I didn’t have to remove the rest! There were a few staples ends that broke off during removal and were too short to grab with the pliers. I pounded those flat with a hammer to prevent the sharp edges from being a hazard. Then the prep work was finished and the cushions were ready to be recovered. 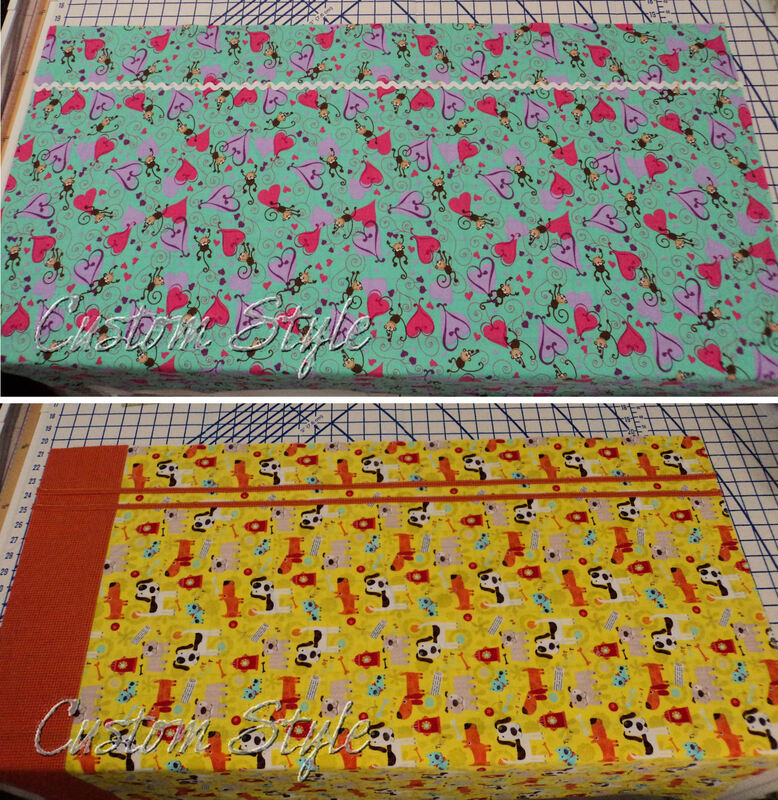 I first cut two-inch wide bias from each of the four fabrics. One yard of each had been ordered, and all but the reddish-orange came with an extra generous cut of nearly a yard-and-a-half! This meant that I only needed to cut one strip of bias from the long three (there was actually enough left over for a second seat of each) and I just pieced two strips of the orange. 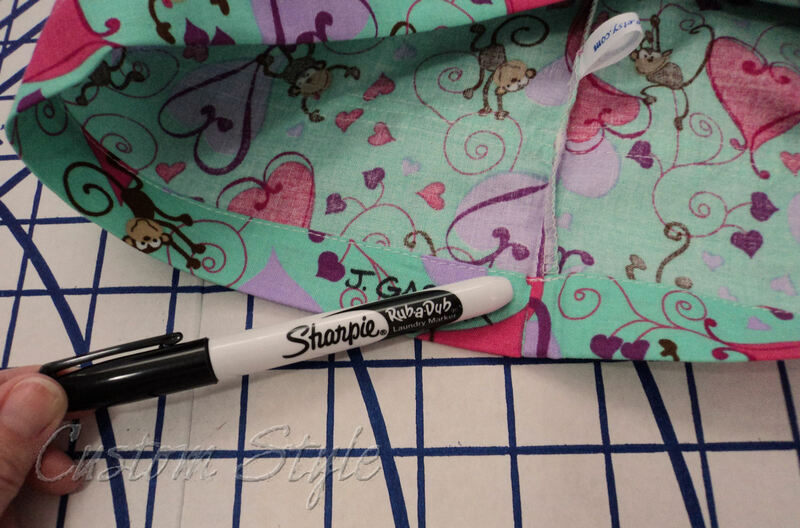 Marking the bias is easiest with a clear quilting ruler with grid. And it’s already 2-inches wide. 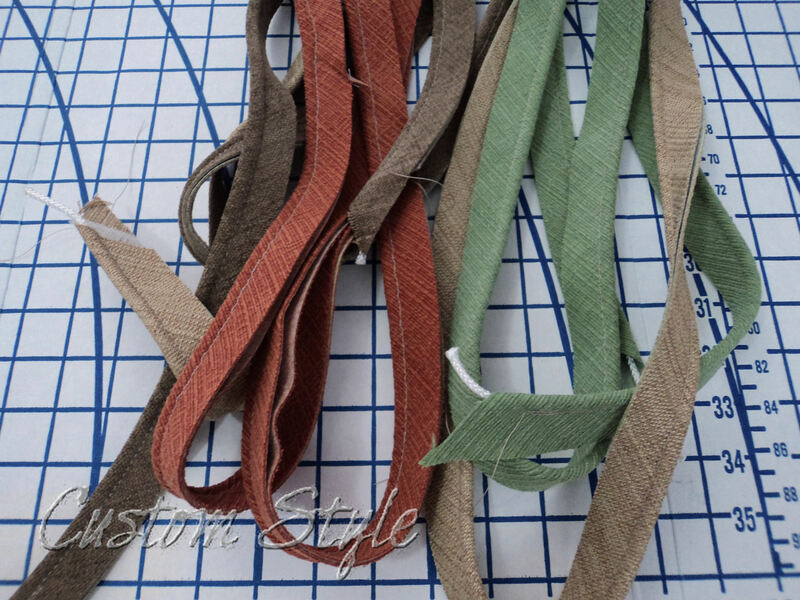 I had some utility cotton cording in my stash, but it was just a little too wide to make the piping out of the thick upholstery fabric in the size I needed. So I went to the hardware store and picked up some one-eighth inch nylon cord for about $4. To make the piping, I wrapped the bias strip of fabric around the cording and sewed through the fabric next to the cord with a zipper/cording foot. 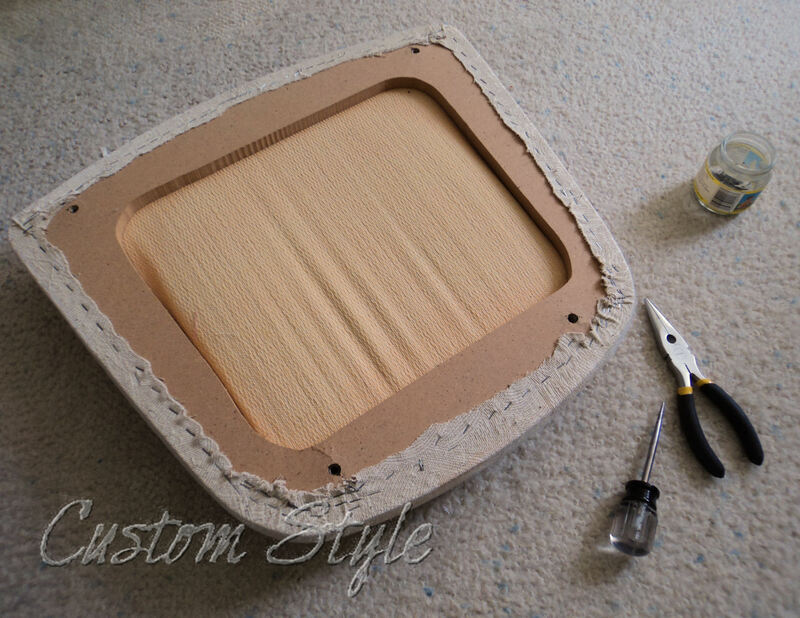 I followed the guidelines that came with the upholstery fabric and used a ballpoint needle with nylon thread. 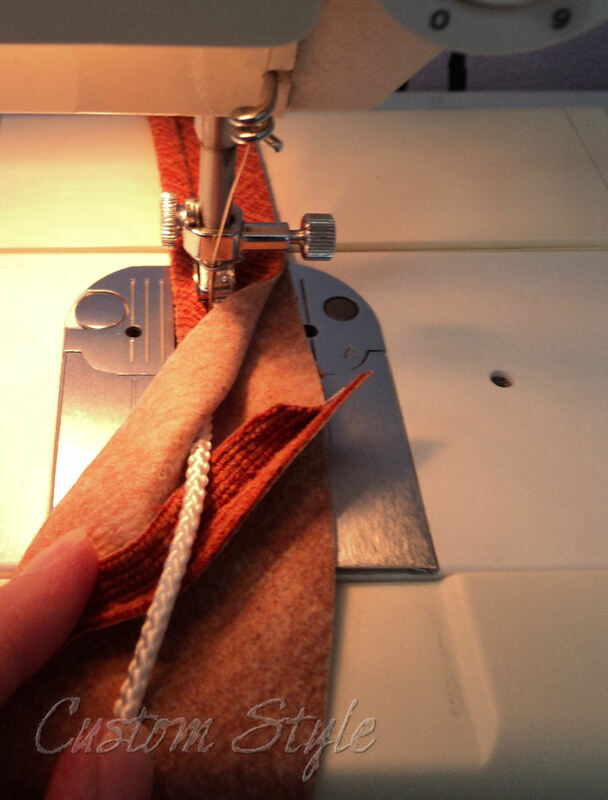 Sewing over the seam of the pieced bias. My pile of finished piping. 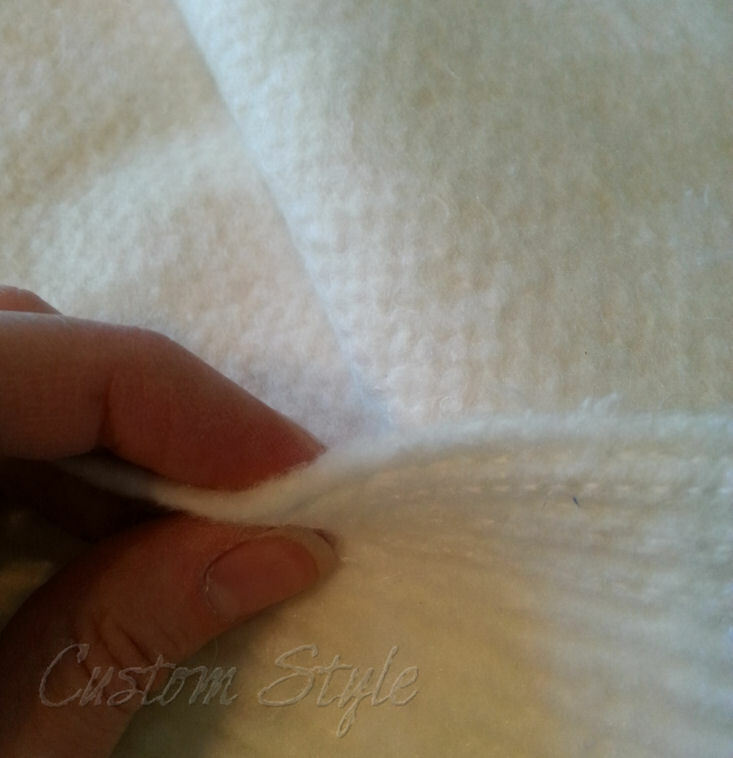 To cover seat cushions, first determine which direction the fabric’s nap (the fuzzy texture) is going. You should be able to feel the direction by running your hand over the right side of the fabric in a straight line with the grain. 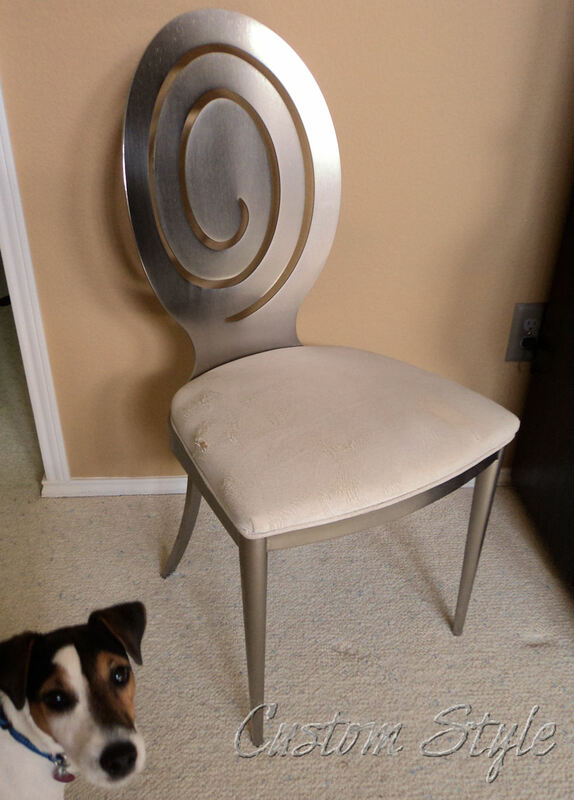 You want the fabric to feel smoothest (the least drag) when you “pet” the chair from back to front. I found the nap direction and then roughly traced (on the wrong side of the fabric) the amount I needed to wrap around the cushion and marked the front with an “F”. 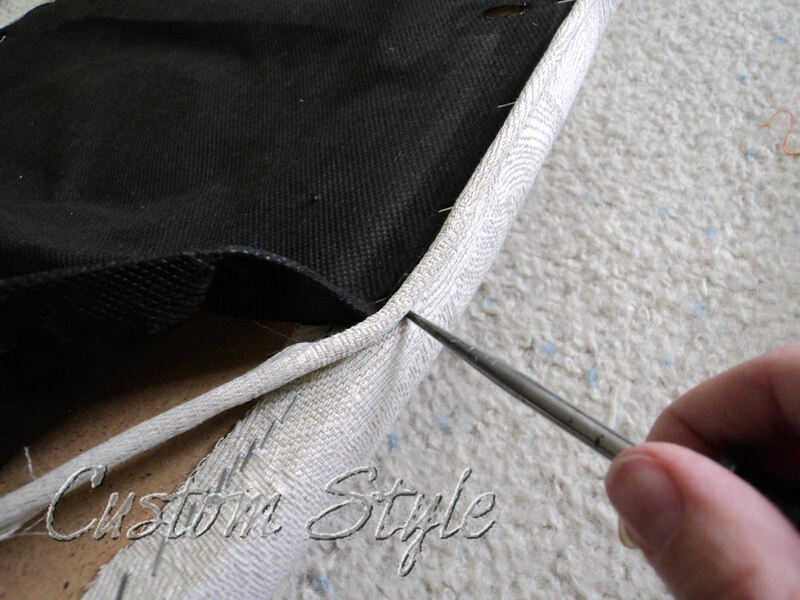 Once the first few staples were in place on all four edges of the cushion, I followed the previous cover’s folds and eased the fabric around the corners and curves making sure that the top and side were as smooth as possible. (It’s okay if the bottom is a little lumpy and folded because it won’t show.) And I trimmed off excess fabric as I went. (I’m holding the side and the front is on the Right). After I was satisfied with the fabric wrapped around the cushion (I needed to remove and redo a few staples as I went), I moved on to piping attachment. and stapled as close to the cording as possible. so that the overlap would be hidden by the center back of the chair frame. Finished piping on bottom of cushion. Detail of piping around curves and corners. Cushion with piping compared to those without. as I pulled it tight & stapled it to the bottom next to the piping trim. cut small holes where the screws attach. I think they turned out really well and should last for years since they are covered in thicker fabric than they were before. 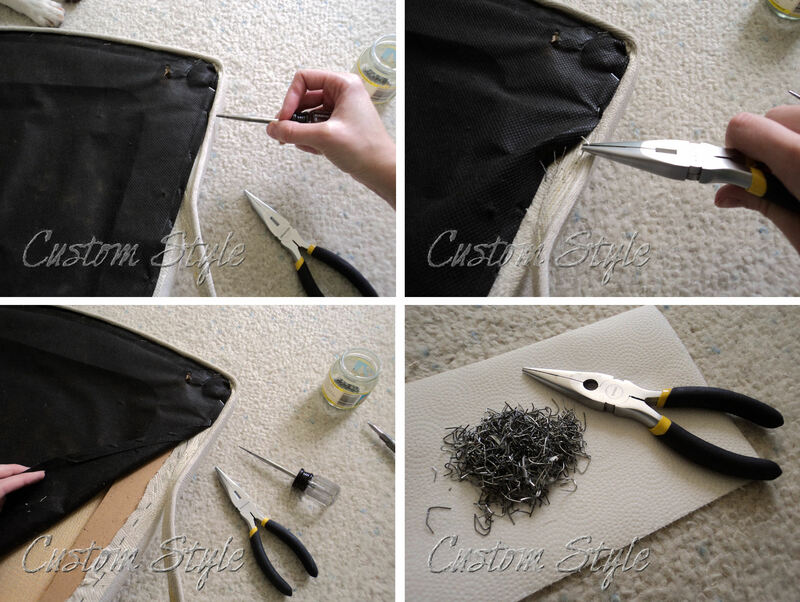 Reupholstering is not really difficult from a technical standpoint, but your hands take a lot of abuse with a project like this, so plan for a couple days of minimum hand use afterwards should you attempt to recover your own. 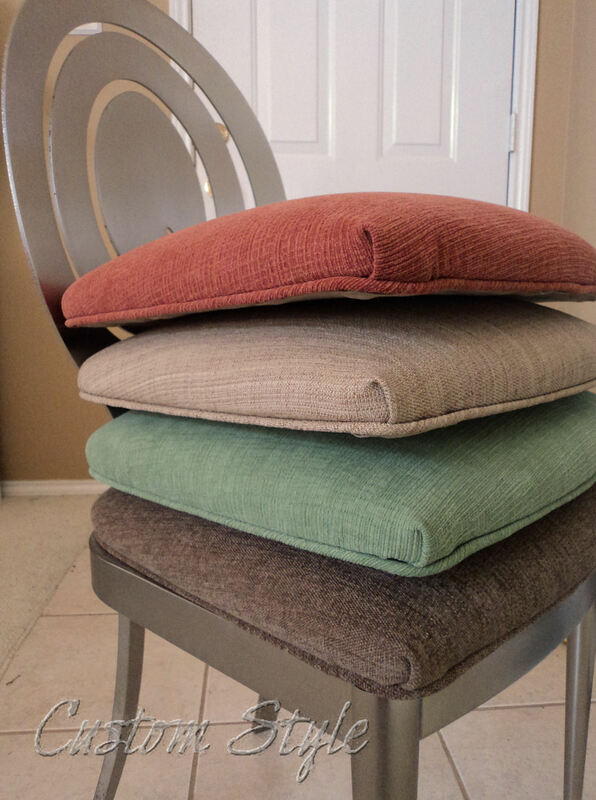 My stack of completed seat cushions – my hands were very happy to be finished stapling! 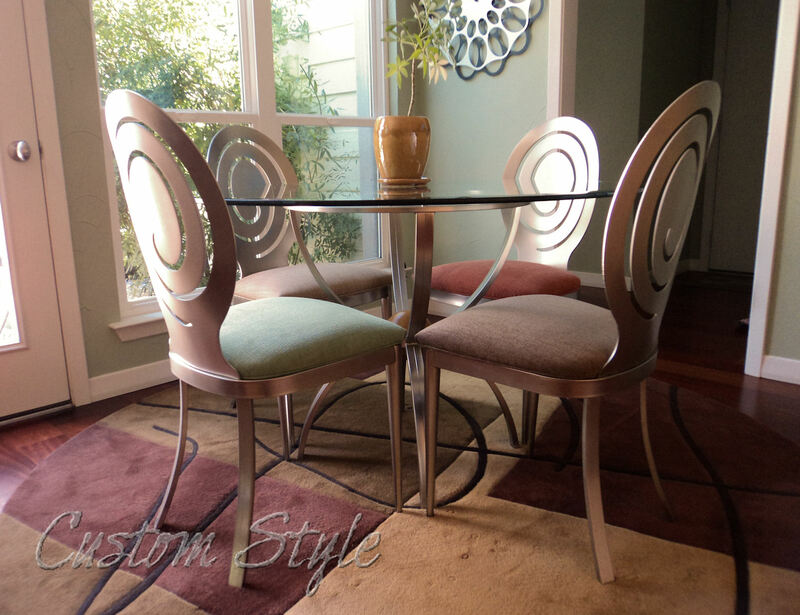 The completed dining chair cushions side-by-side. 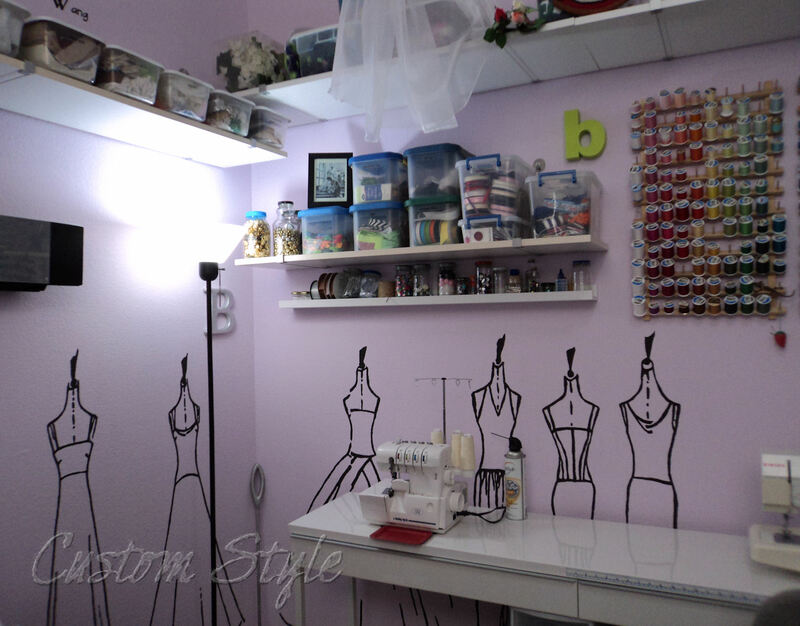 Since my post about my IKEA-hacked cutting table & my organized closet drawers is by far the most popular post on my blog, I thought you might enjoy seeing the rest of my sewing room. 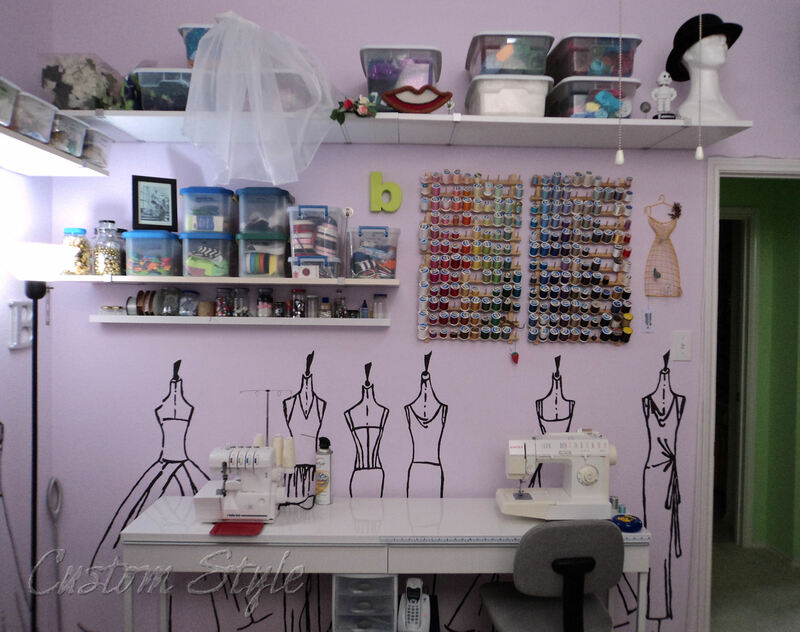 My sewing room is a 10’ x 12’ bedroom in my house. My goal was to create a space that was both pretty and functional. I didn’t want to feel like I was boxed in by shelves & tons of supplies but I wanted a lot of storage space. I decided to put shelves on the wall of the room to make use of the vertical space and went searching for the most aesthetically pleasing yet strong shelving. I found my visually simple solution at The Container Store: suspension cable shelf brackets that can hold up to 100 lbs. per pair! I waited for a sale at The Container Store to buy the brackets and saved even more by buying the actual shelves at Home Depot or Lowes (I don’t remember which one had a better price on laminate shelves at the time). 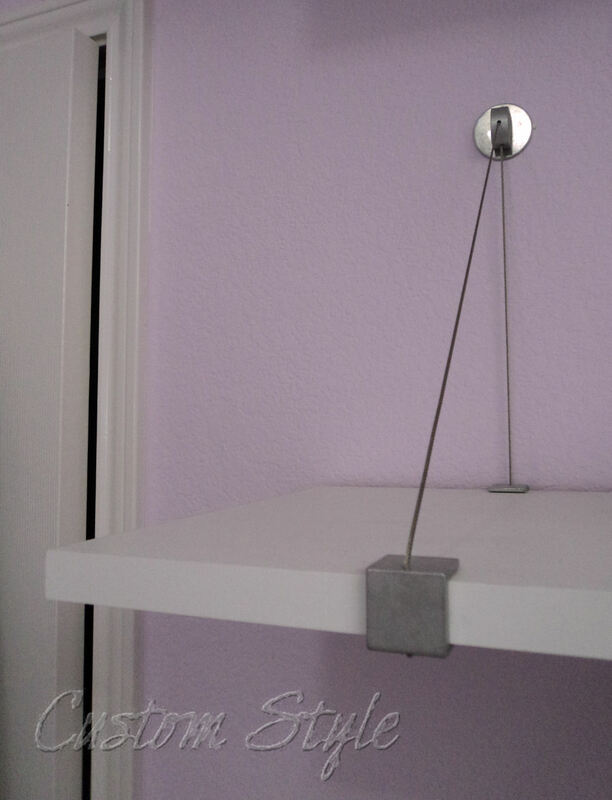 One of the best things about these shelf brackets is the fact that you only have to put two holes in the wall to hang one shelf (but I will admit they are a bit of a pain to level when you first hang them). I filled my shelves with clear storage boxes in various sizes. I find that unless my storage is see-through, I forget I have stuff and I don’t really read the labels. My assortment of clear storage containers on the shelves. Then IKEA started selling the BESTA BURS desk – it was literally only about ¼” different in length and width from the table we had built and it had two long drawers! 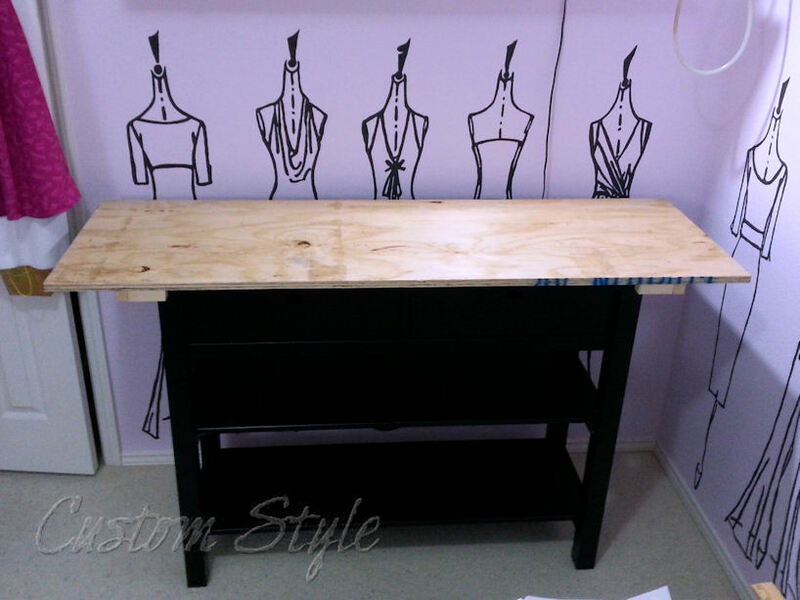 I decided to splurge and buy it (after all, my cutting table only cost about $100 to build) because there would be no hacking involved to get exactly what I wanted. How often does that actually happen?? 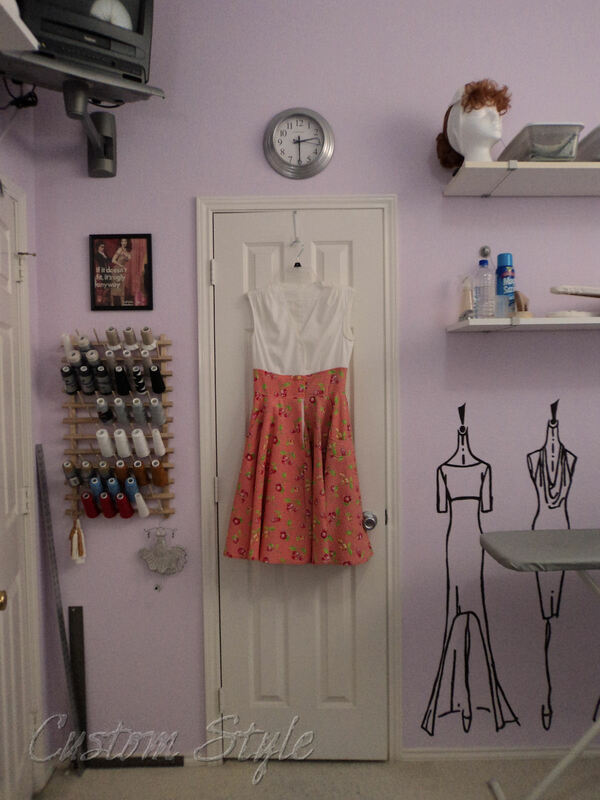 in front of my sewing machine. My cone thread rack behind the door to the room and next to the closet door. I plan to expand my standard thread racks a bit in the next couple of weeks (I seem to have outgrown what you see in the pictures), and I will explain how I hang them once I’ve done that – it’s actually really simple to do. You might remember from this post that I keep my ironing tools on the shelf above the ironing board in my ironing corner. My ironing corner complete with “backwards” board. I have since added another RIBBA picture ledge to the wall above my cutting table for storing some spools of bias tape and elastic. (to the Left of the one I had previously hung). 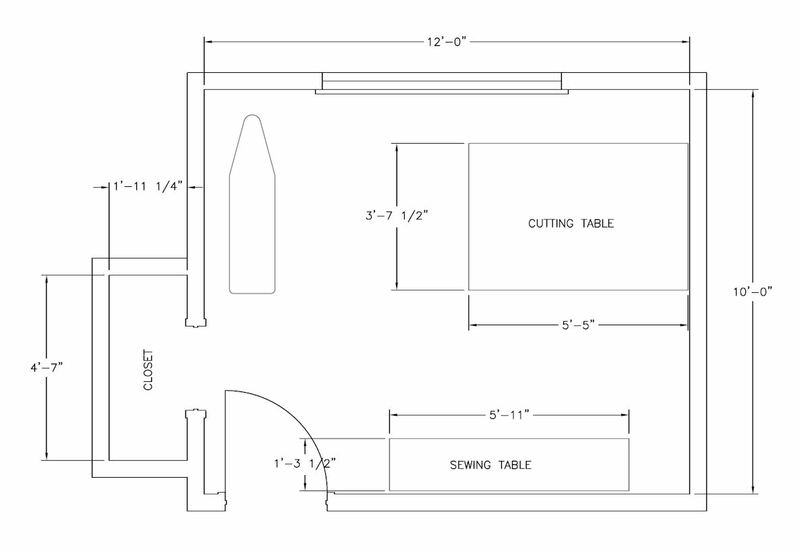 And I have been mulling over the idea of moving the tea cart out of the room and expanding my cutting table, or even setting up one of my other machines in a more permanent way. Now if only I could always keep it as neat and tidy as it looks in these photos! It’s amazing how fast it gets messy (and creeps into other rooms) when I’m in the middle of my projects! Of course, when am I not in the middle of a project? I’m in a Book! So Let’s have a Giveaway! Fun bedding always makes me smile. As a kid, I loved my cute Sesame Street sheets – why do we have to give up the colorful and amusing things when we get older? A couple years ago, a friend of a friend joined the Army and was sent to Iraq. Our mutual friend and I decided she needed cheering up, so we started to brainstorm ideas for what we could send her in a care package. The general idea was to give her a way to decorate her windowless room and make it feel more like a home than a depressing army bunker. 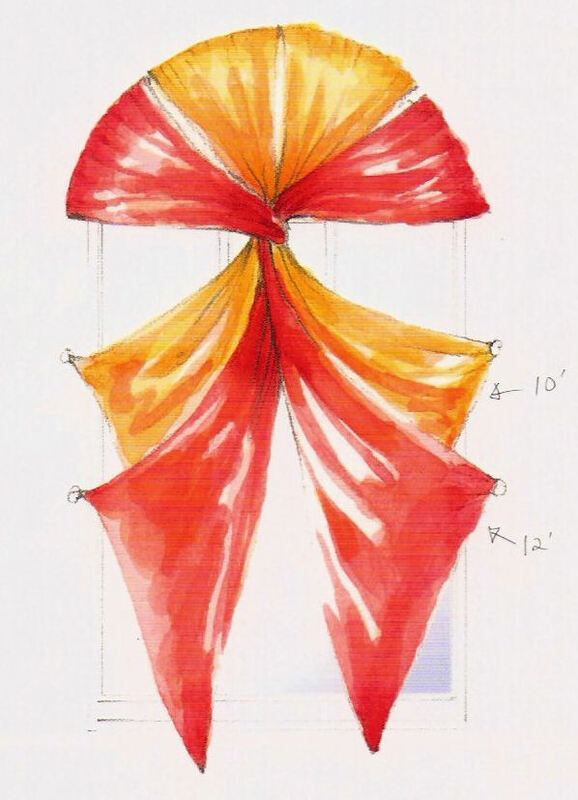 We included things like flameless candles, a curtain that could stick to the wall with a strip of Velcro, and a pack of four stick-on square wall mirrors to make the panes of a “window” for the curtain. We really crammed a huge amount of stuff into one flat-rate shipping box! Of all the items we included in the box, her favorite thing was the handful of homemade pillowcases I made for her bed. 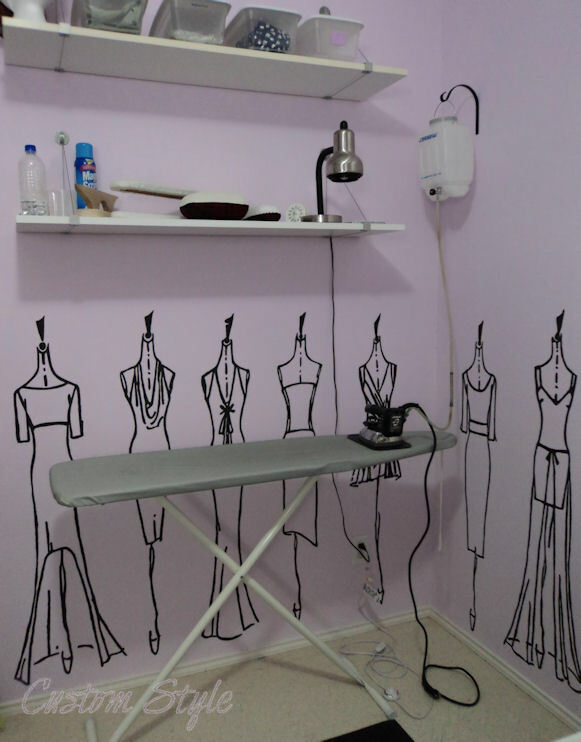 It was such a simple & easy way to decorate her room. And it was great fun picking out cutesy cotton prints for the cases – we were able to fit 5 in the box (one was even for her roommate)! Currently, she is stationed in Alaska and has local shopping available to do her own decorating, but she misses her custom made pillowcases (the Army lost them when she moved). So I’ve made 3 more to send her. Three more pillowcases ready to send to her. 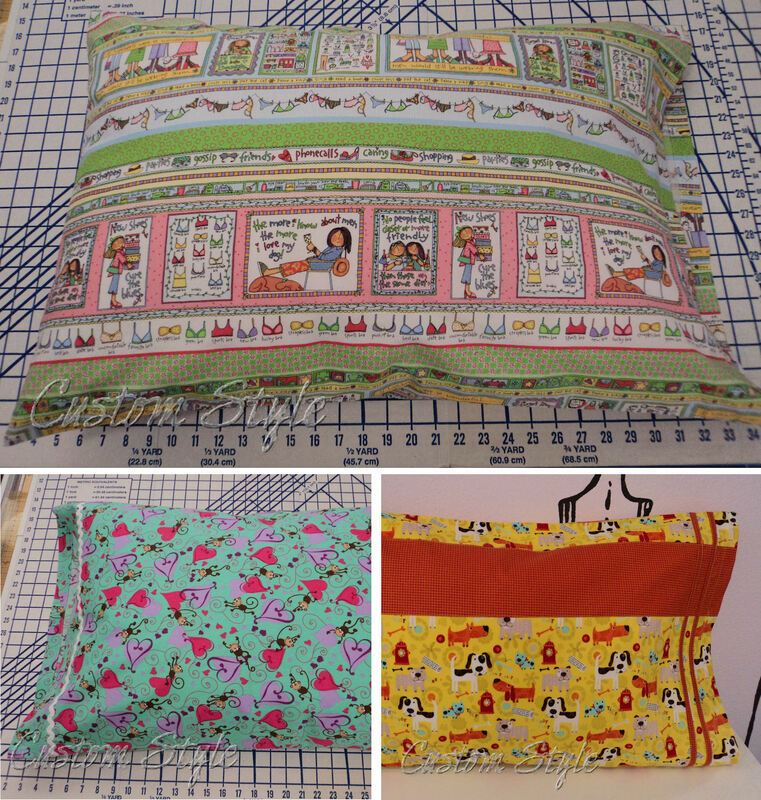 I made my pattern by measuring some of my own store-bought pillowcases and choosing the fit I liked best – I was surprised how different some of the cases were! I guess there are no standards for standard size pillowcases (ironic, huh?). My crudely drawn paper pattern. I thought others might like to make some for themselves or to put in a care package for military or students. 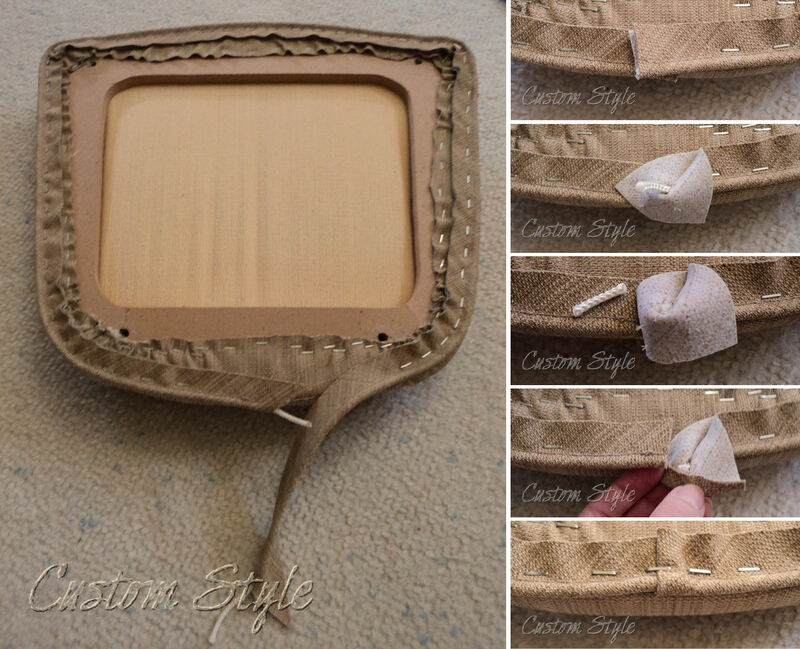 It is one of the easiest sewing projects and is prefect for beginners or kids who want to learn to sew! 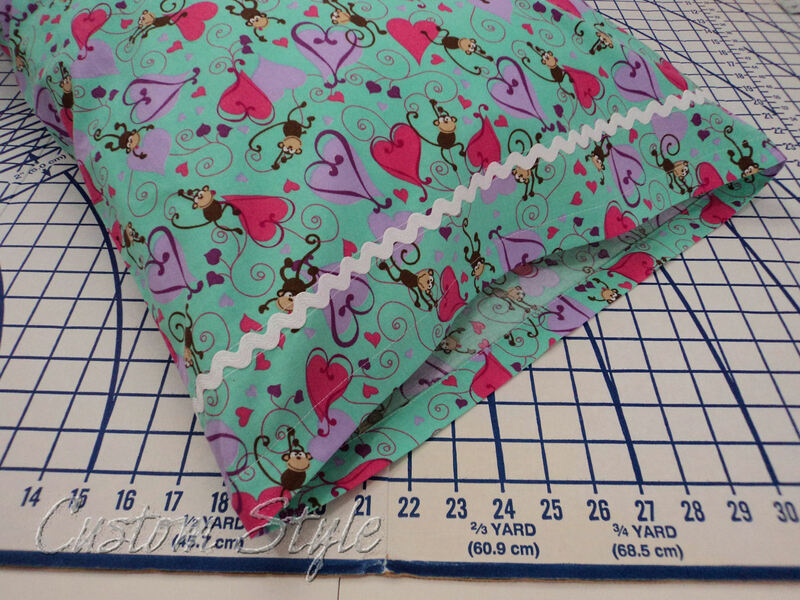 Helpful hint: After cutting your fabric, attach any trim before you sew the pillowcase seams. Of the 3 new ones I’ve just made, I have made a plain hemmed version, one simple version with one line of rick rack trim, and one slightly complex version that required a little problem solving (because I didn’t have quite enough yardage). so I didn’t add any trim. 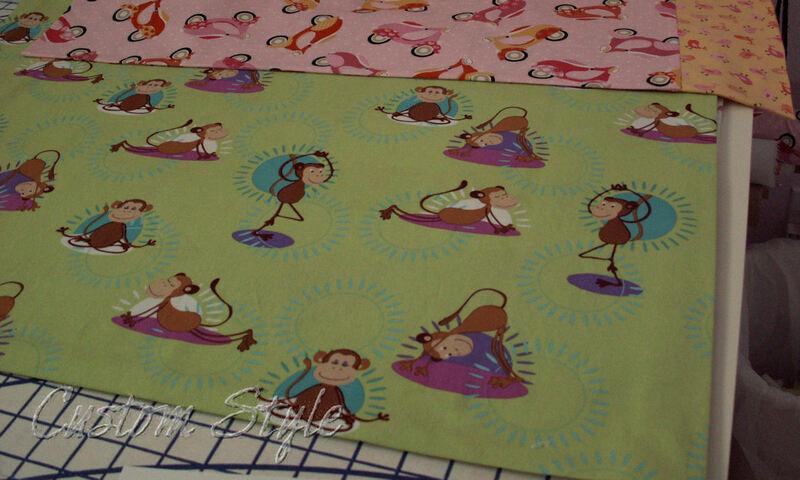 I added a single line of rick rack because this cute (but slightly busy) monkey print needed to be broken up a little. Name written inside hemmed edge. If you make any fun pillowcases of your own, I’d love to see them! 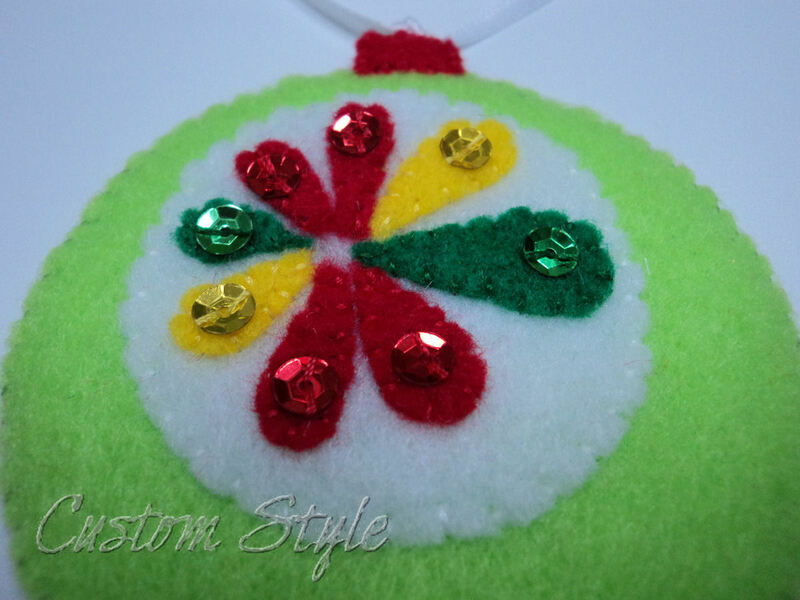 Here’s a super easy project for a quick Christmas decoration. No sewing involved but I wanted to share. I chose three colors of tissue paper – red, green, and lime. I don’t remember why I first thought to do this to decorate our back door for Christmas. Maybe that was the year we lost our fence in a windstorm and I thought it was a good idea for privacy. 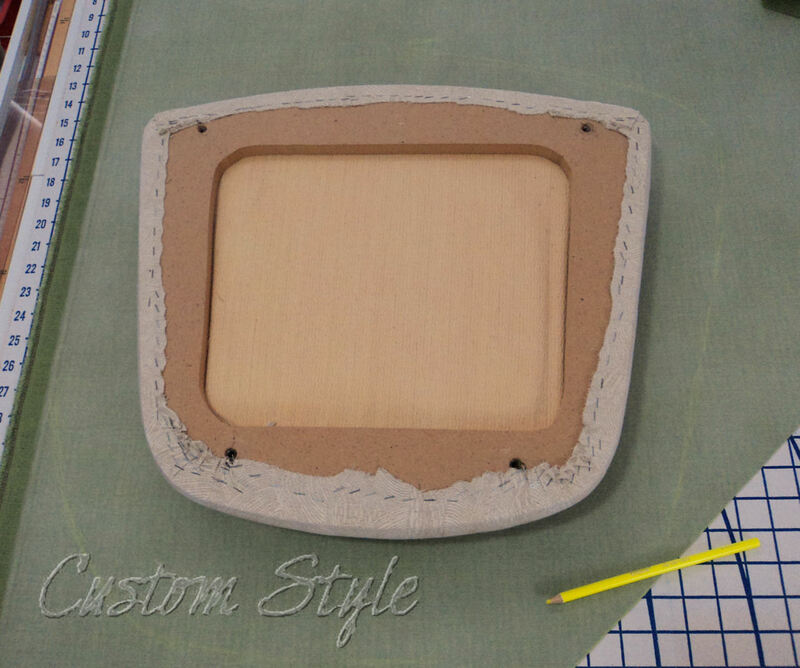 I made a cardboard template to fit in the rectangles of the window frame and traced it onto the tissue paper. Then I simply cut out the tracings, and with a few very, very tiny pieces of double-sided tape around the edges, fastened the colored panels carefully to my window (on the inside). I kept the bottom left open for the doggie viewing-hole & because I didn’t want to cut into a whole new piece of tissue paper for just 1 panel. 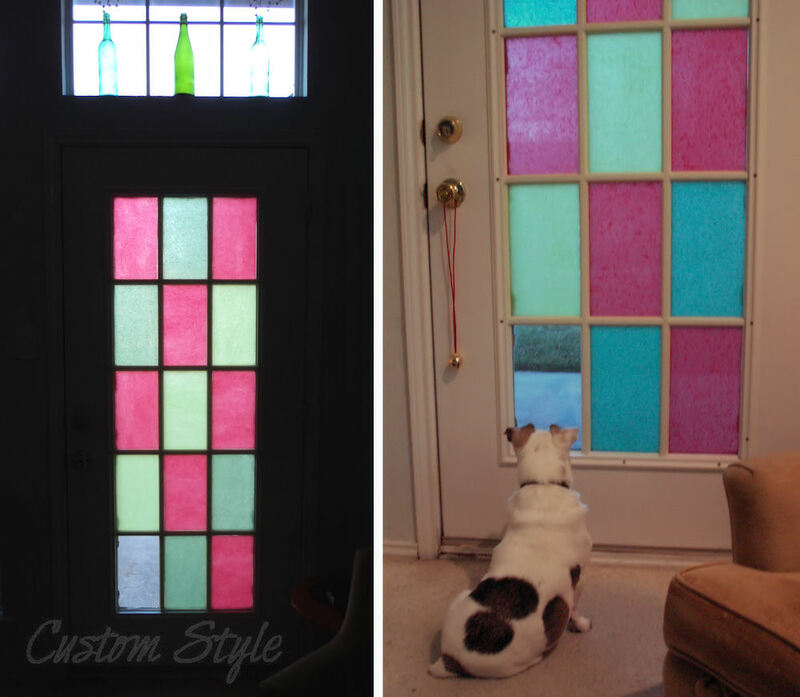 During the day, I have a fake (but pretty) stained glass look to my back door. And at night, it’s extra privacy and glowing color on the outside. Cleanup is easy. All I have to do is rip the paper off and throw it away when the decorations go back into storage. It’s December, so my husband and I have been pulling out all the Christmas decorations. I have a retro 1950s style kitchen and I try to keep my kitchen decorations in line with the theme. 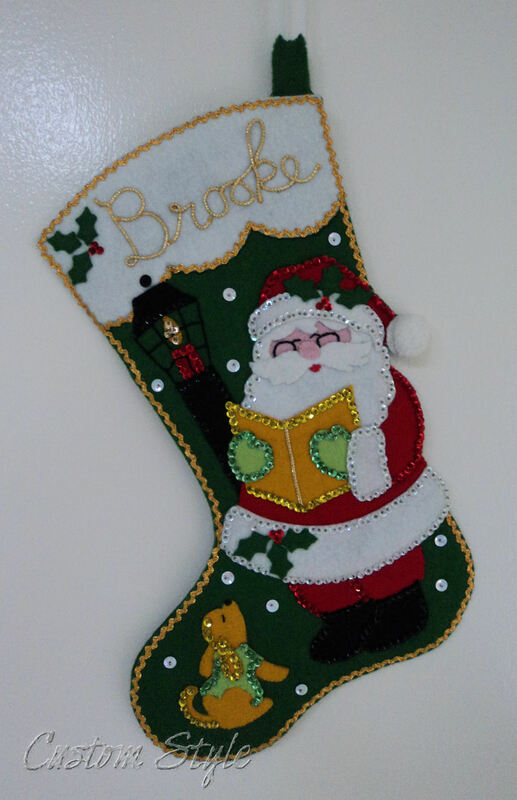 When I was born, my grandmother made me a felt Christmas stocking. I’m sure it was one of those stocking kits similar to what they still sell today, but she made it over 30 years ago – so it has a simplicity that the more modern patterns lack. 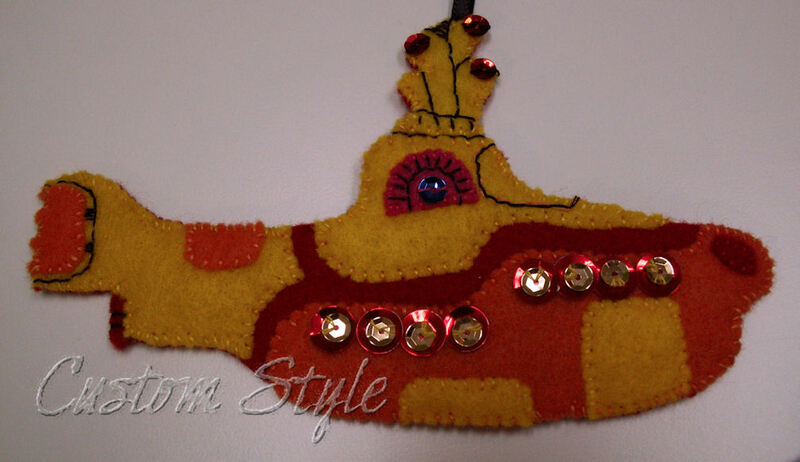 Just felt pieces, sequins, and beads. I hang it on one of the upper cabinet doors in my kitchen. 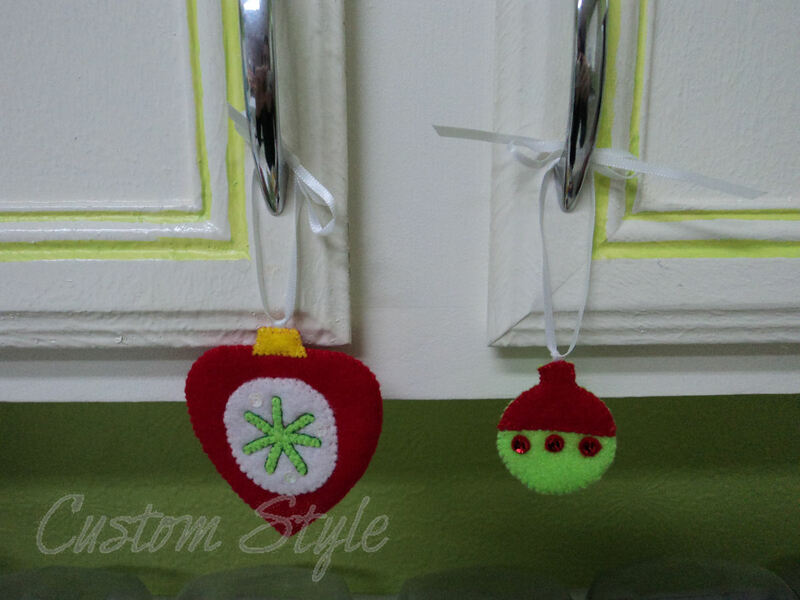 On the long row of cabinets, I hang one felt ornament from each upper cabinet handle. 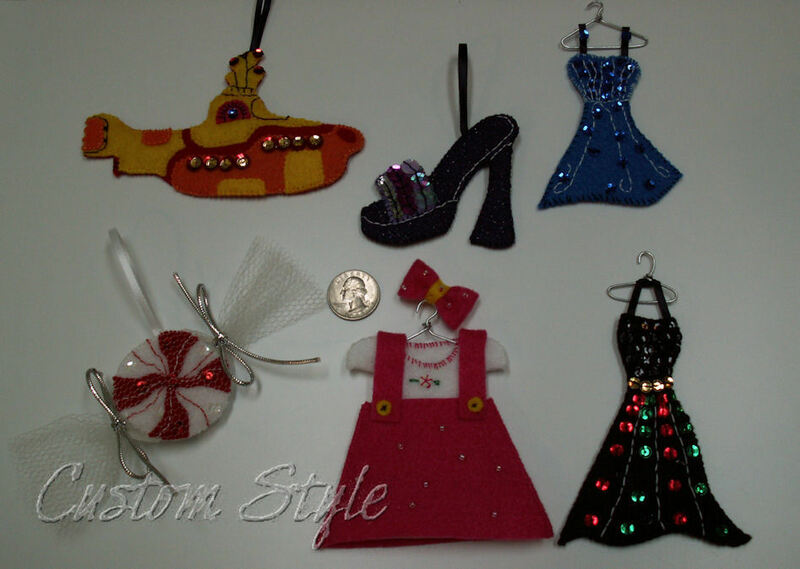 I designed & crafted the six ornaments in various shapes that I found in retro graphics or wrapping paper patterns. In order to attach them to my cabinet handles, I attached two pieces of ribbon on the top of each instead of a loop. That way I can just tie them on with a bow. 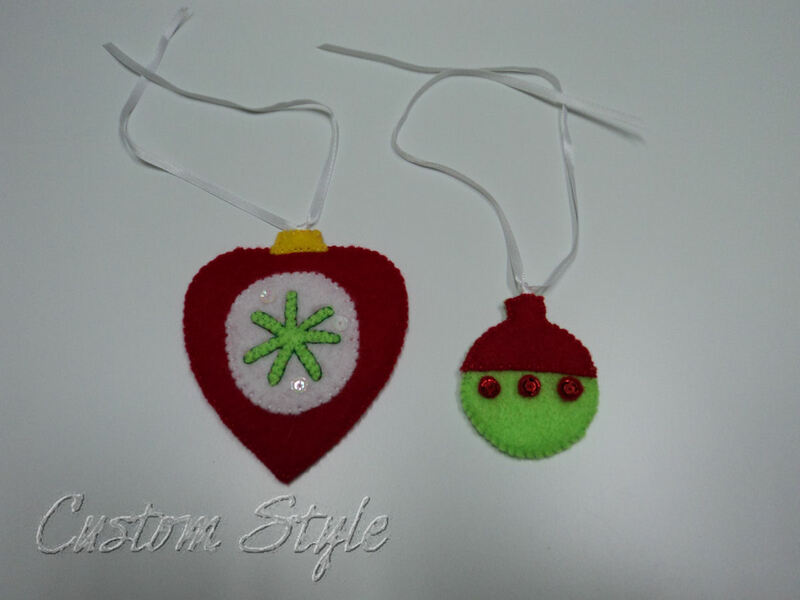 Making the ornaments is quite simple – I just started with a basic shape and then cut tiny pieces free-hand and hand-stitched them on, adding sequins here and there. Once the front design was finished, I cut a plain piece of felt for the back and stitched around the outer edge of the entire thing (remembering to insert the ends of my ribbon at the top edge). The reason I thought to make my retro kitchen ornaments is kind of a long story. A number of years ago, I was working as a costumer on a low-budget TV movie/webisode series and we had a large pile of felt fabric scraps leftover from one of the webisodes that required some costumes made from felt (in the script, the mother character was making costumes for her daughter’s school play). 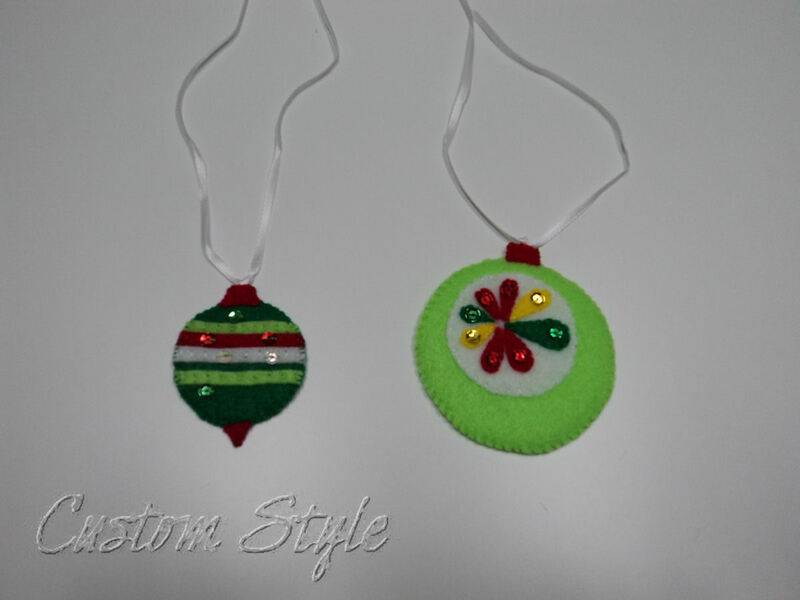 Since it was just before Christmas and the workdays on set were long (and often boring), I kept myself busy by creating some hand-sewn ornaments out of the felt scraps and a few sequins that I had in my personal stash. 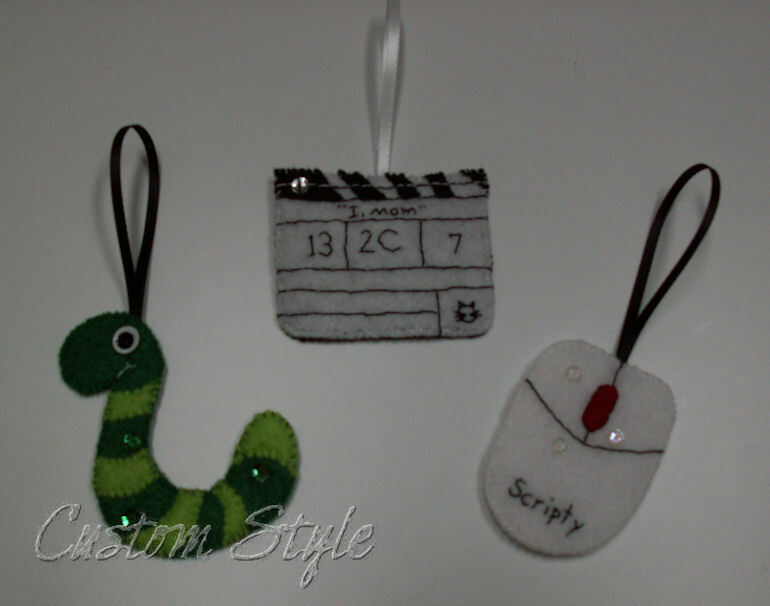 I created 15 unique ornaments for some of my fellow crew members and a few of the actors – it was a completely free way to give personal Christmas gifts and I had a lot of fun making them. A couple of my closest crew friends even joined me in the craft and made some gifts for their own friends & families. 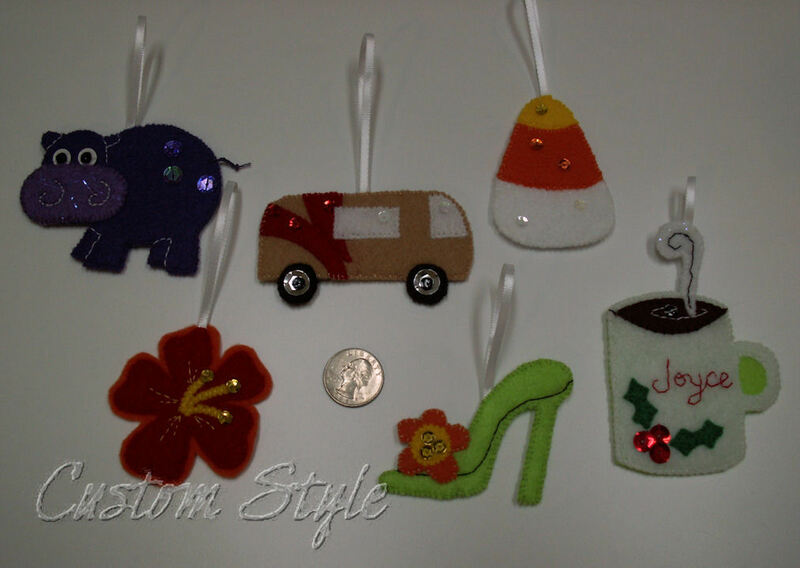 Some of the ornaments are inside jokes and others just represented an interest/job of the recipient. I sketched the more detailed ones and then traced the shapes I drew onto the felt before cutting & sewing. 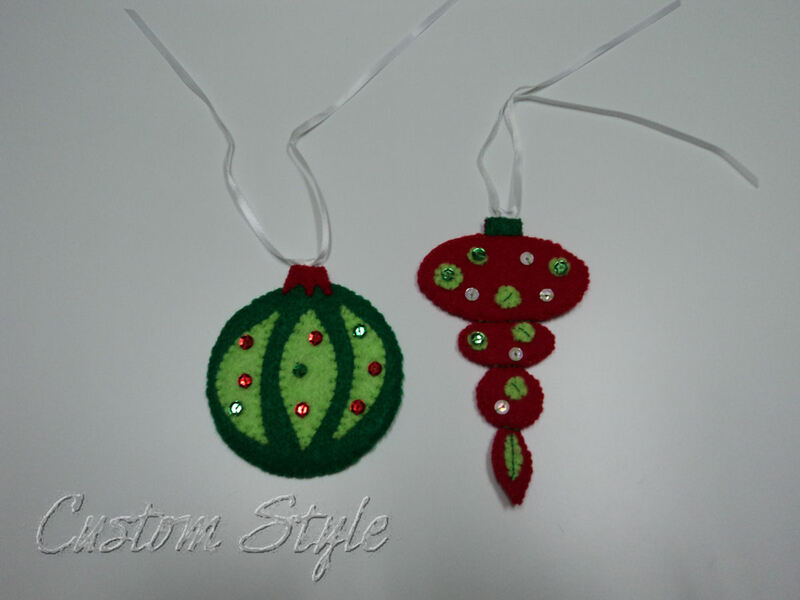 I gave each ornament inside a hand-delivered Christmas card, and something like this would be perfect for mailing inside a card because they are flat and light – they might not even cost extra postage (you’d have to weigh it to be sure though). Everybody who got an ornament was thrilled – especially since each one was so personal. 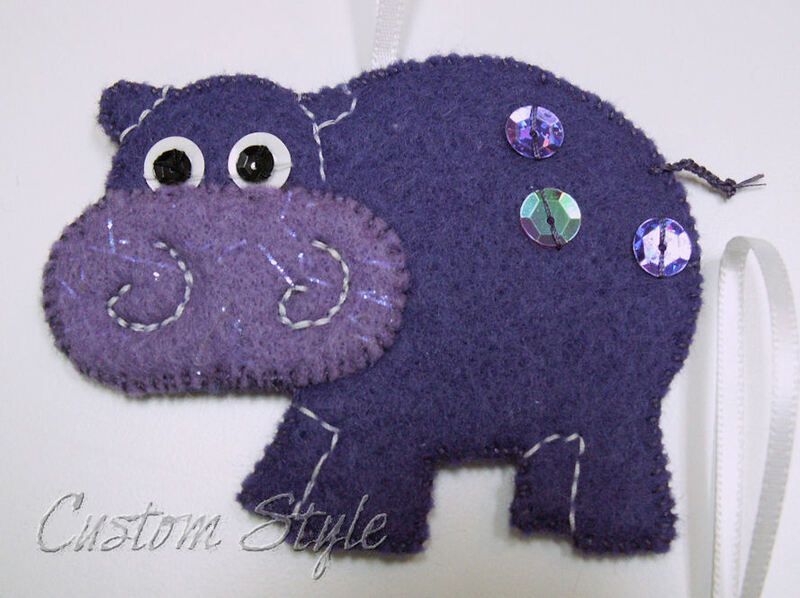 Because who wouldn’t want a Hippopotamus for Christmas? 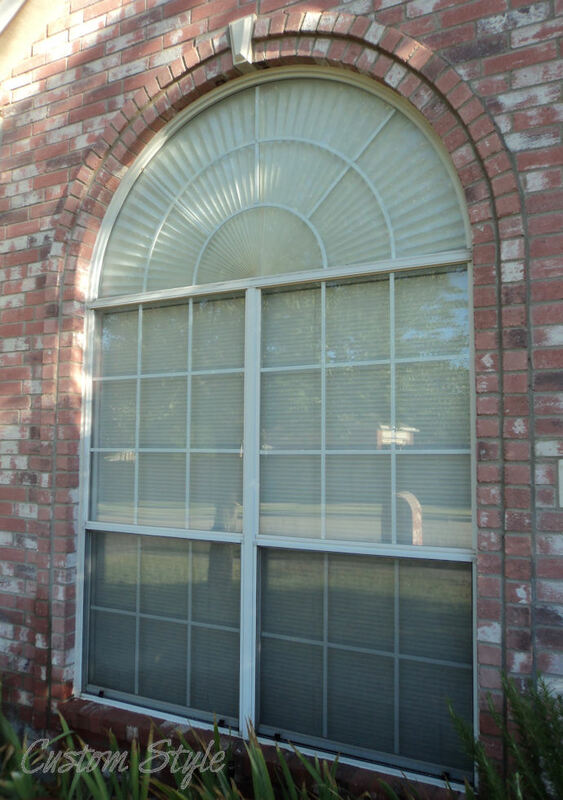 When we moved into our house years ago, I was faced with the challenge of dressing palladian or half-circle windows. We have 5 of them and the biggest one is in my sewing room. It faces south, so the light is constant and wonderful, but the glare was so bad I almost needed sunglasses while I was sewing! I quickly bought the paper “accordion” pleated window shades to put in the upper half-circle of the windows (on top of the mini-blinds), just to diffuse the light a little in three of the rooms on the front of my house. The paper shades are great because they are cheap and easy to cut to fit. 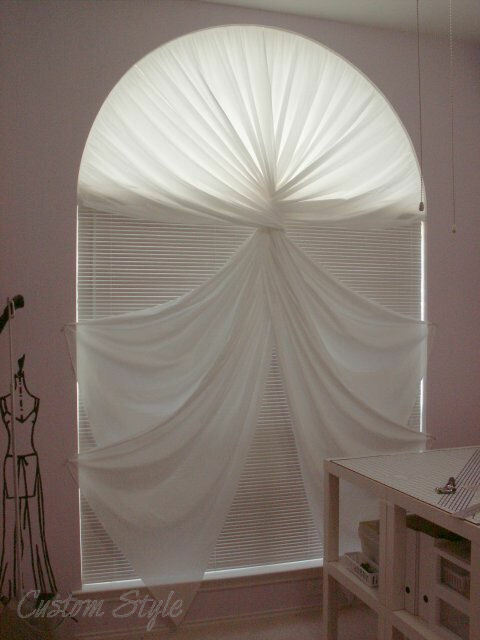 I had to attach two 36” shades for my sewing room window because the diameter of the arch was almost 72 inches. The other windows were smaller and could be filled with just one shade, folded in half and fanned. Window with paper shade from outside my house. The paper fans look great from the outside of the house, but my sewing room window was a little boring on the inside. It needed a curtain to dress it up. The inspiration sketch with my measurement notes. Unfortunately, the book doesn’t include any instructions or how-to’s and most of the best ideas are only sketches. So I needed to engineer a way to rig my curtain to match the sketch. In another book on my shelf, I found some lovely photographs of simple curtains hanging in arched windows. No curtain rod required! The only problem was that the how-to seemed to be written in code because it called for “touch-and-close tape”. What on earth?? For at least two years, I pondered my window and brooded over what touch-and-close tape could be. Then one day I cracked the code! I remembered that the book was written by a British decorator so… I figured it had to be a lost-in-translation thing. Then – lightbulb!!! – I knew! “Touch-and-close tape” is British for what Americans call “hook-and-loop tape” or Velcro. It was so stupidly simple, I can’t believe it took me years to figure it out! The same curtain design would be fun in all kinds of fabric combinations, or edged with a colored stripe. I considered adding a black edge around my panels for an added graphic effect, but decided it would detract from my wall decorations and just kept it simple. I gathered the tops of the 4 long panels and secured the gathers by sewing the edge to the fuzzy strip of velcro, which was cut to fit exactly one quarter of the half circle window frame. (This also makes it easy to wash the curtains because the soft loopy velcro won’t tear the fabric like the hook side.) Then it was as simple as hanging, twisting, attaching loops (or safety-pins) to 4 small nails in the wall, and cutting the hem at the correct angle. I simply serged the bottom hem on each panel, but a rolled hem would work as well. Now I have an artistically draped curtain that helps filter the light and looks great with my décor. The finished curtain in my sewing room. I know that anyone who has any sort of curved window has been frustrated at some point by the lack of options for window treatments. I had a feeling there was a simple solution out there without spending a fortune on fancy hardware! And when you have a beautifully shaped window, why should you have to cover up the architectural interest? 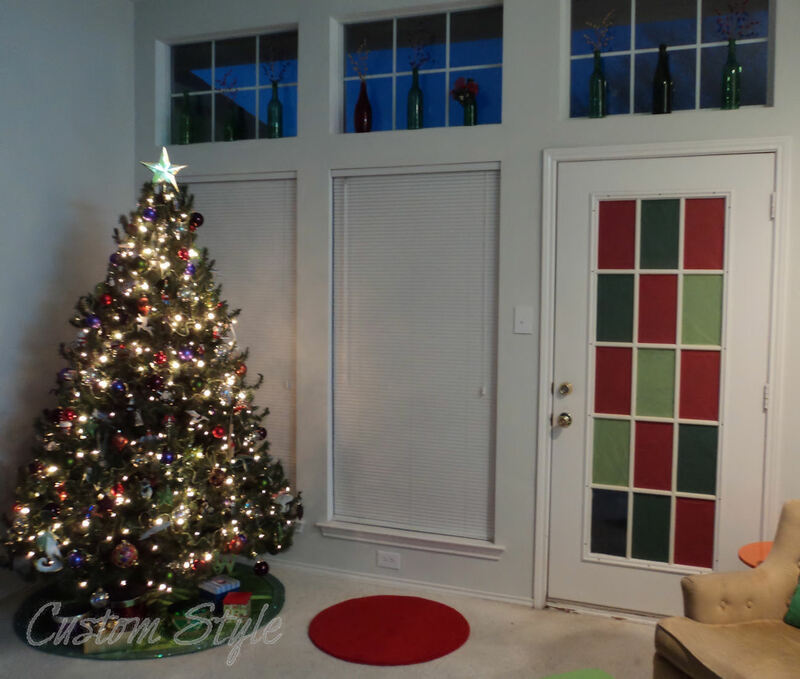 I hope this – my adventure and eventual solution – will help other owners of unusually shaped windows solve their own decorating dilemmas.